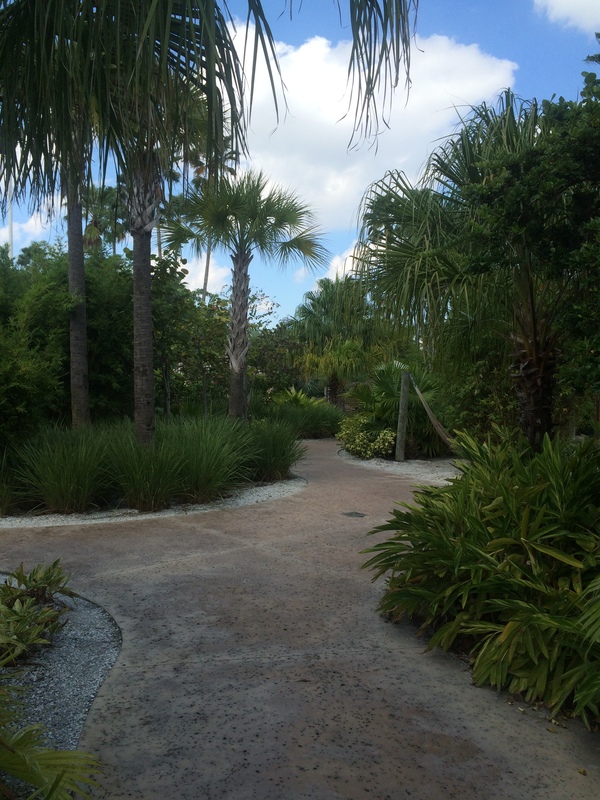 This park was developed by George Millay (1929-2006) who previously founded the SeaWorld chain of parks. 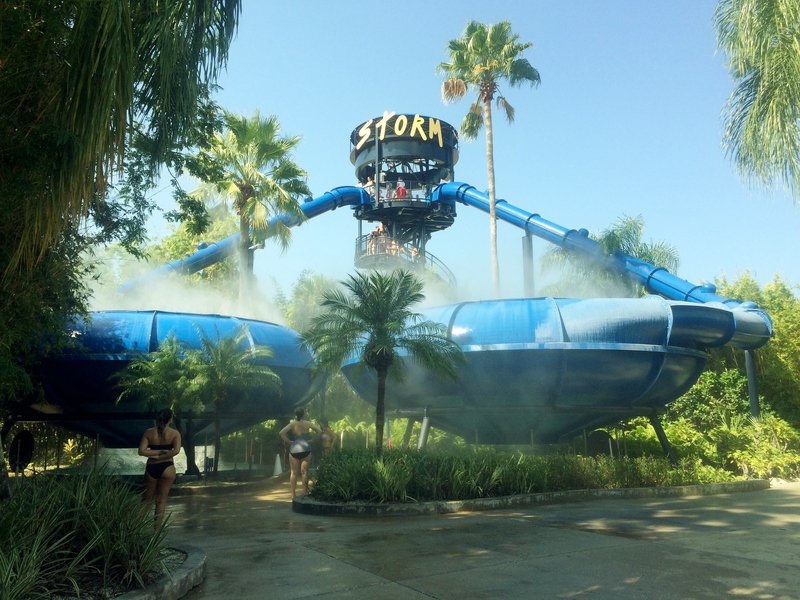 While developing what was then called Sea World Florida, George realized that people needed a way to cool off in the hot and humid climate of Florida. 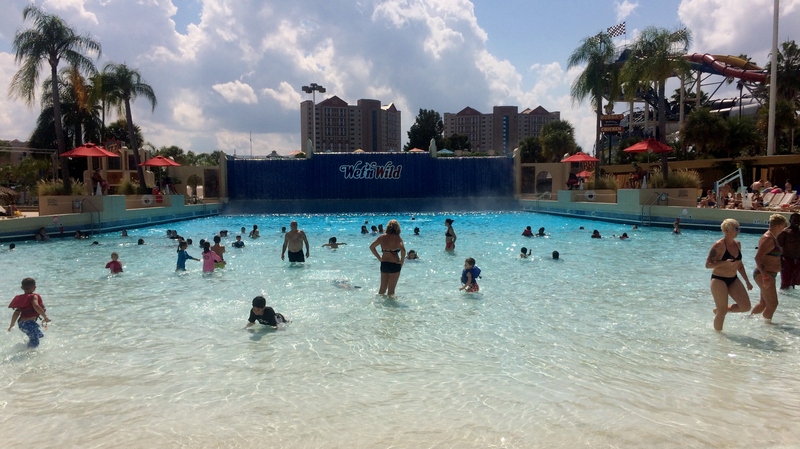 George had seen the Splash Pad at Ontario Place in Canada and had seen the wave pool at Point Mallard Park in Decatur, Alabama and wanted to combine the two in one park. 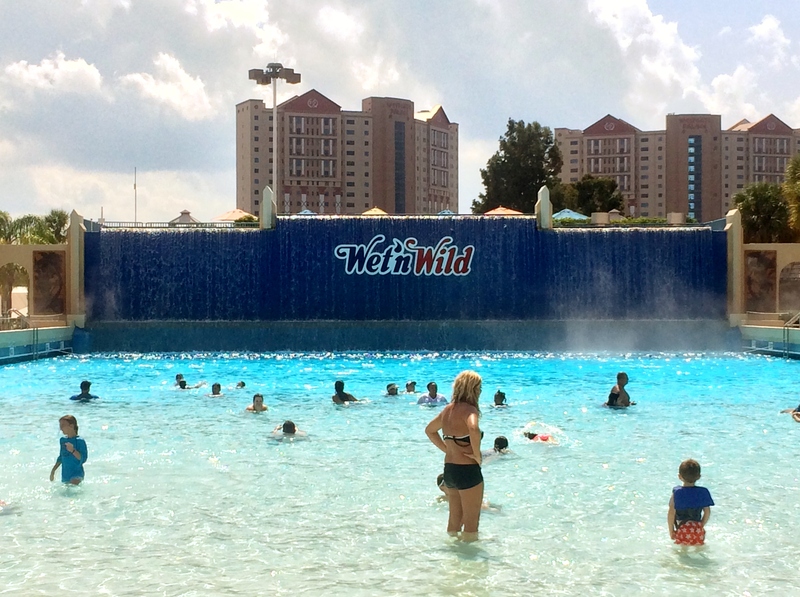 What resulted was Wet n’ Wild Orlando, the worlds first modern water park. 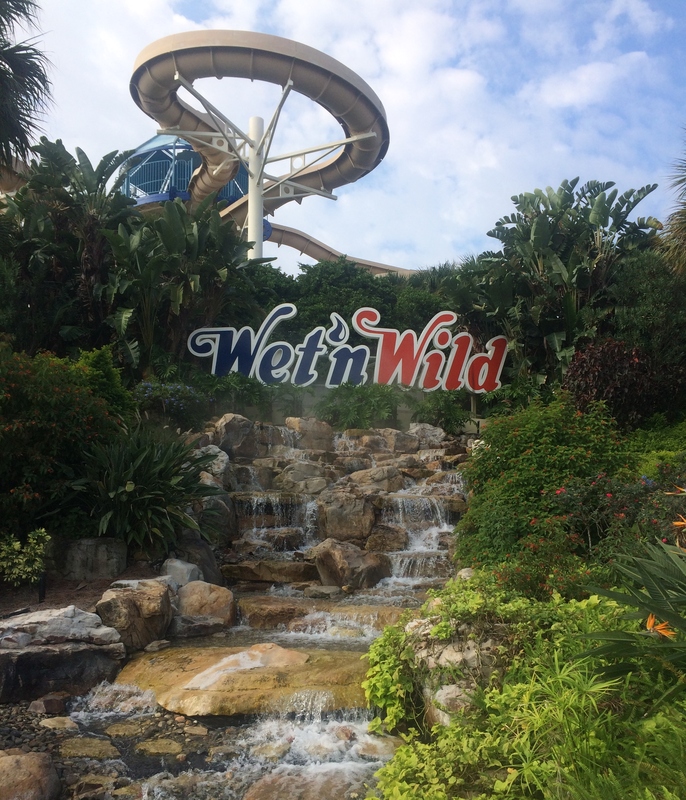 This park opened on March 13, 1977 and was the first in a chain of water parks that opened across the country including Wet n’ Wild in Arlington, Texas, USA which was later bought out by Six Flags and renamed Hurricane Harbor, and Wet n’ Wild Las Vegas which was located right on the strip in Las Vegas, Nevada, USA. George Millay eventually sold off his interests in the park and all the other parks were sold off as well including this one. Universal Orlando Resort bought the park in 1998 when the other parks were being sold off and it currently is the only park that is still operating under its original name. 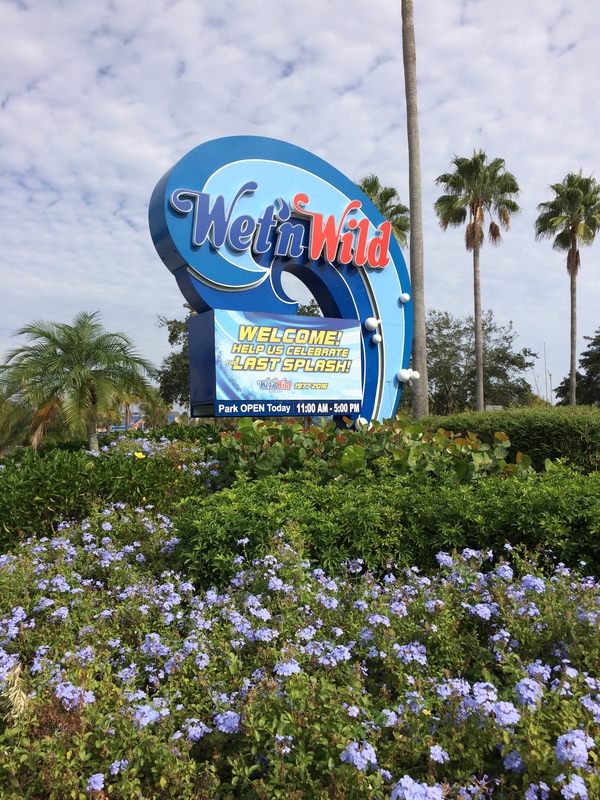 George Millay was given the very first Lifetime Achievement Award from the World Waterpark Association who named him the official “Father of the waterpark”. 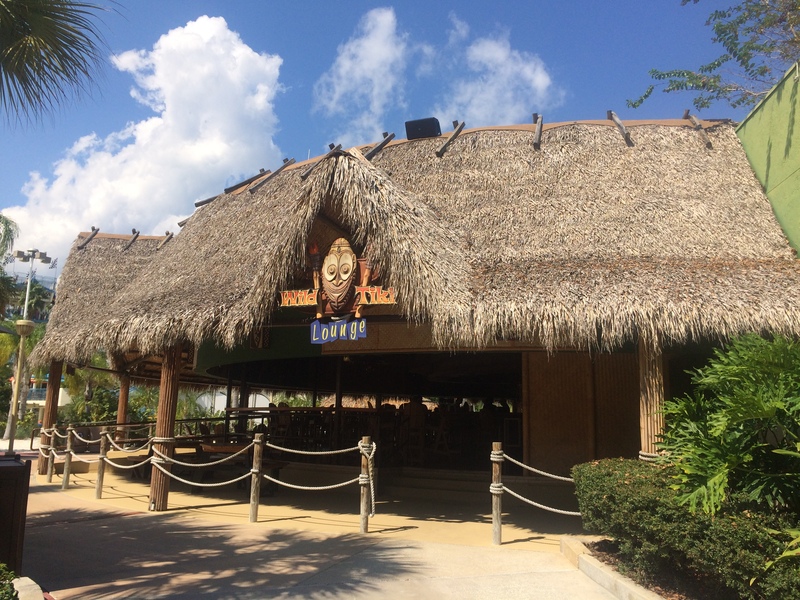 Unfortunately, this historic park will close forever on December 31, 2015 as Universal Orlando Resort announced their new water park, Volcano Bay, will be opening around the same time. 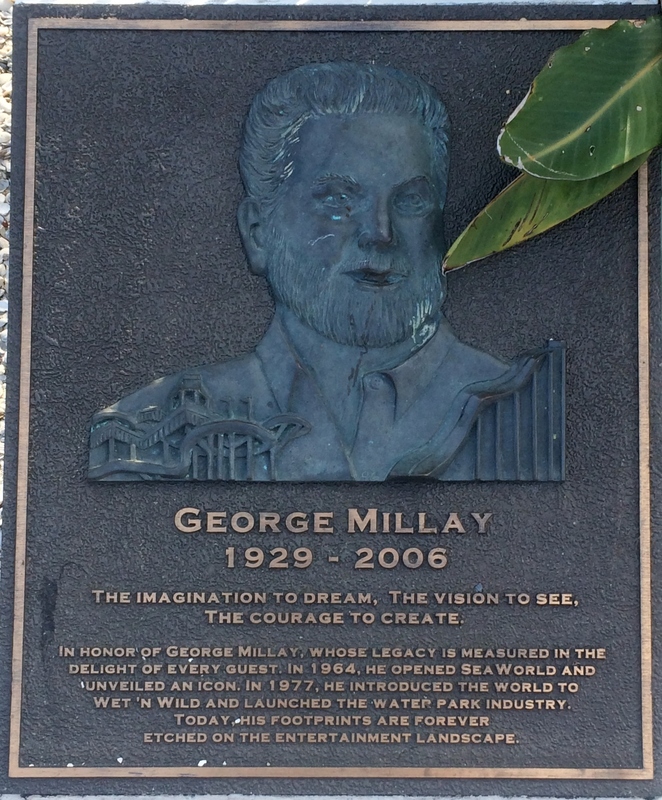 There is a book about the creator George Millay called “The Wave Maker” and it details George’s life which includes the founding of SeaWorld and Wet n’ Wild. I found it to be an interesting read as he did much more than just found those two park chains. The book is currently out of print so you’ll need to go online to look for a used book. 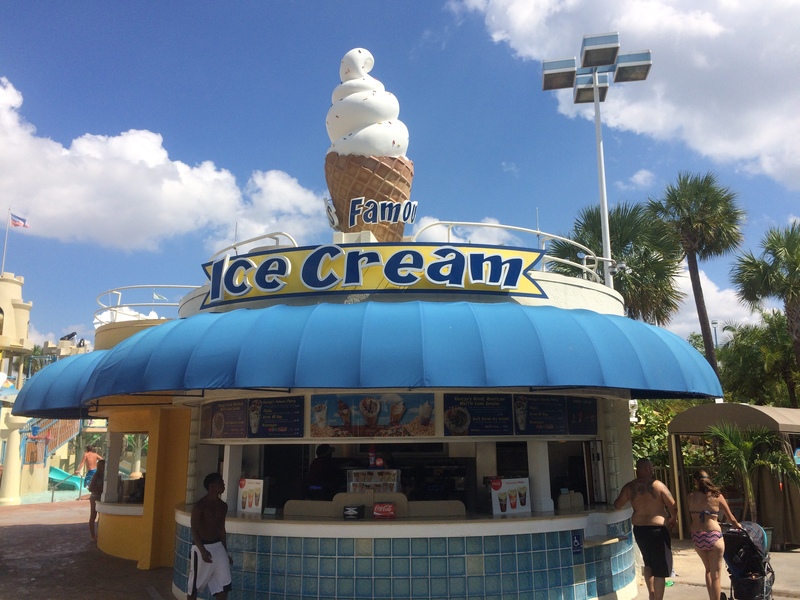 I’ve been going to this park ever since I was a child back in the early 1980’s so I’ll try my best to give you a little history on what rides, slides, and pools were at certain spots in the park. 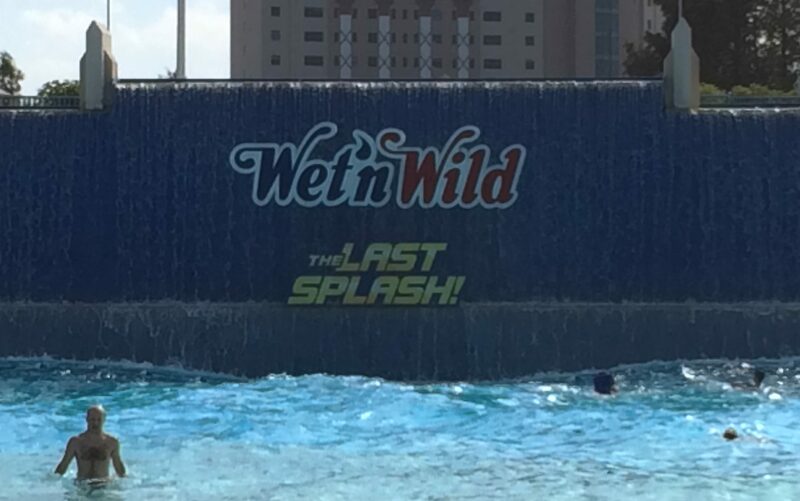 It should be noted that Wet n’ Wild originally had their own mascots which were two water drops called Drip and Drop. It is unclear to me as to when the mascots were stopped being used. With that being said, lets head to the park and dive in. 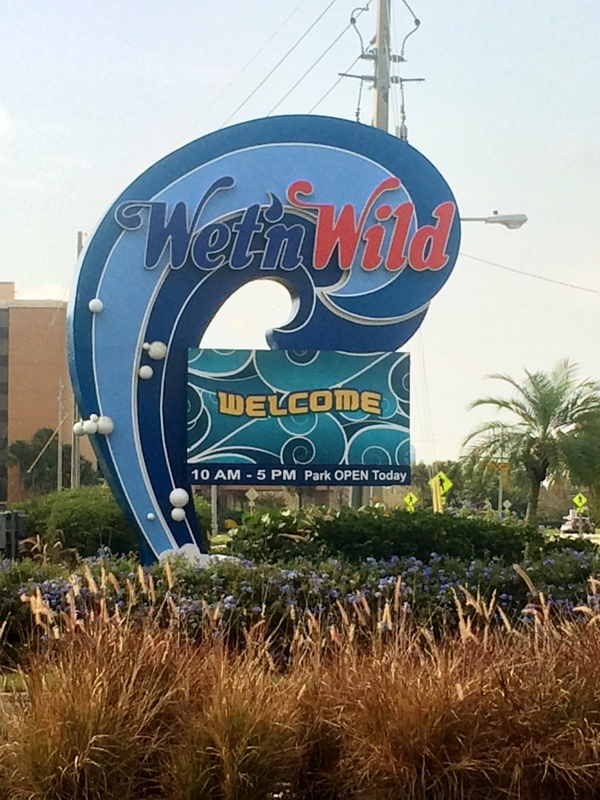 This is the entrance to the parking lot off Universal Blvd which is across the street from the park itself. You’ll need to pay the $13 parking fee (more for RVs and camper trailers) and cross the street at the International Dr & Universal Blvd intersection. Then you’ll need to walk a short distance to the main gate. The park installed these banners advertising when certain attractions opened and their historical facts plus some interesting information on what was going on at that time. 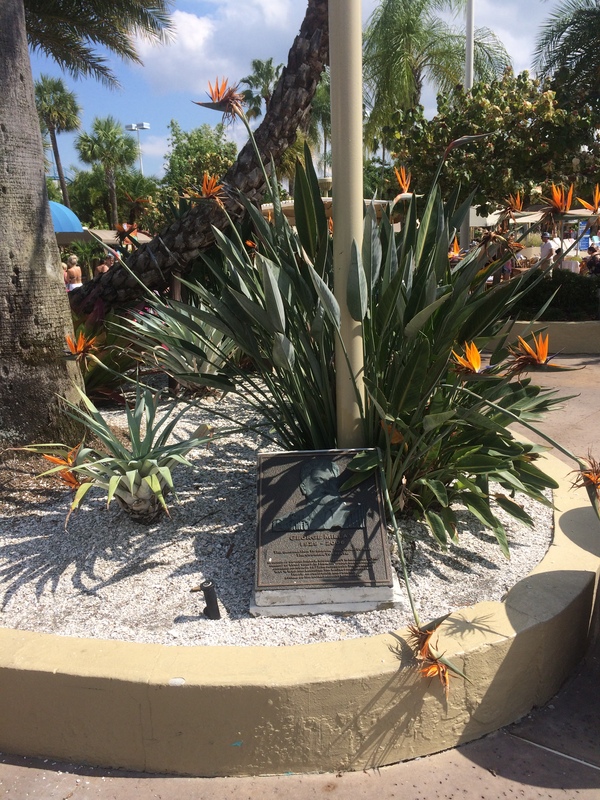 Once you pay the entrance fee, you’ll see a small plaque off to the left in front of you. 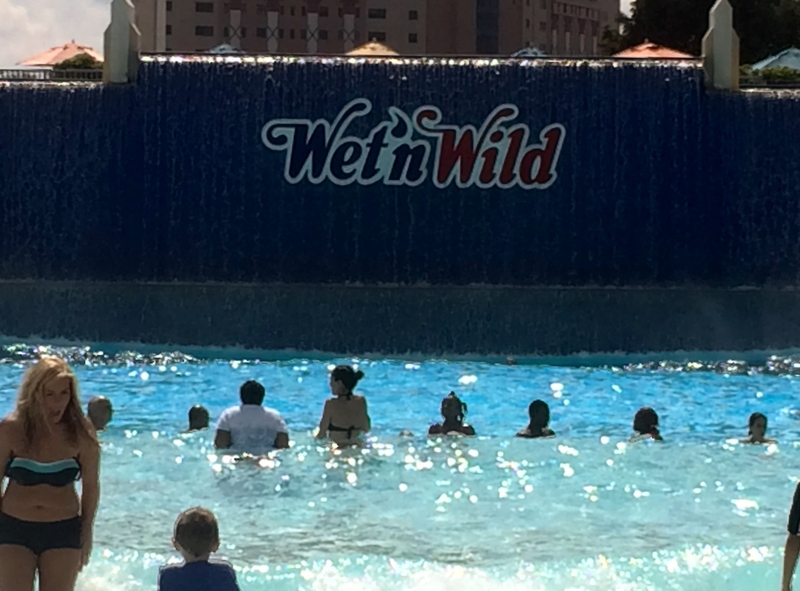 That plaque honors George Millay, the founder of Wet n’ Wild. Right to the left of this plaque are the changing rooms, restrooms, and showers where you can get a shower and change in and out of your swimwear. 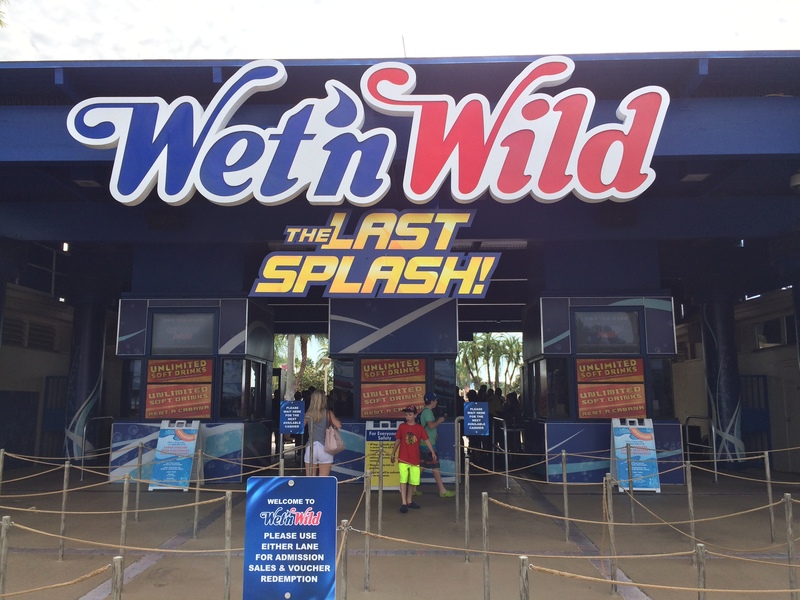 You’ll need a place to store your goods now that you’re ready to play so we’ll head back across to main gate to the rental station where you can rent different sized lockers for the entire day and buy the official Wet n Wild towel. 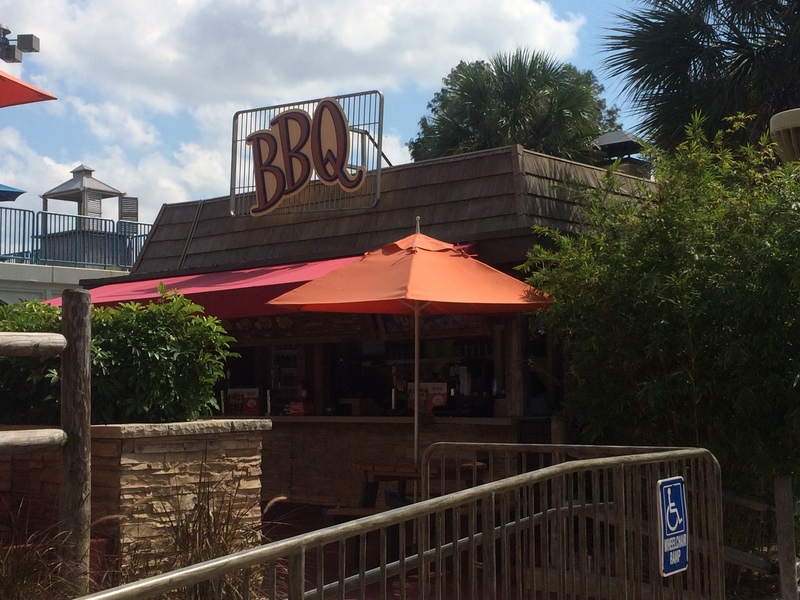 Right next to this building are several stands where you can buy wrist bands so you can reserve you slide times and an eat all day dining option for Barbeque (BBQ). 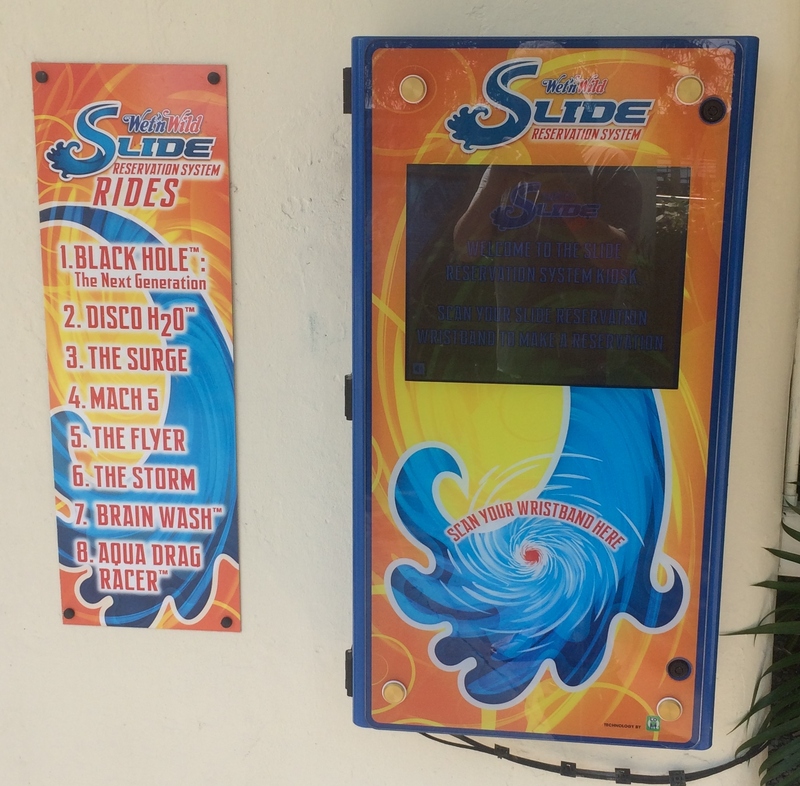 To reserve your slide time, just look for these kiosks, hold your wristband up to the designated spot, and follow the directions. Before we continue, there re a few things that need to be said. 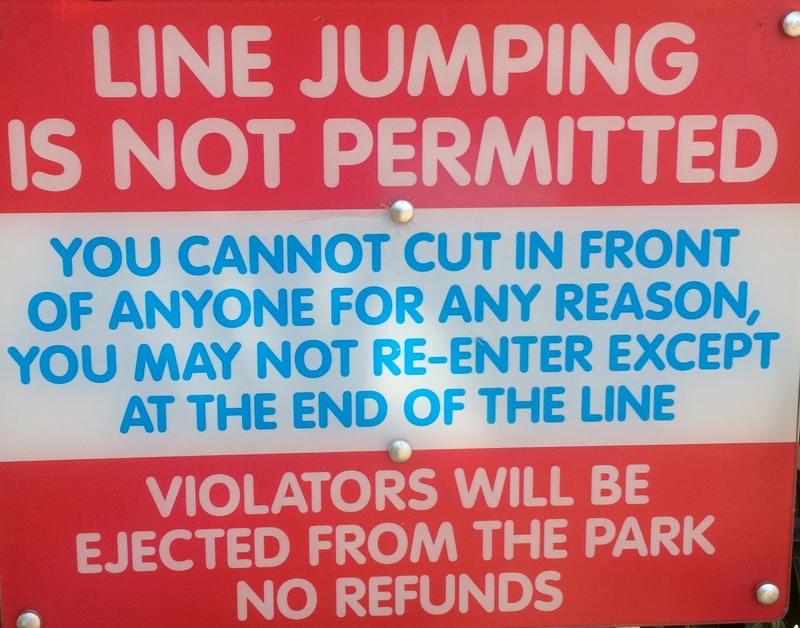 Line jumping is a serious offense and you will be ejected from the park without refund so don’t even try it. 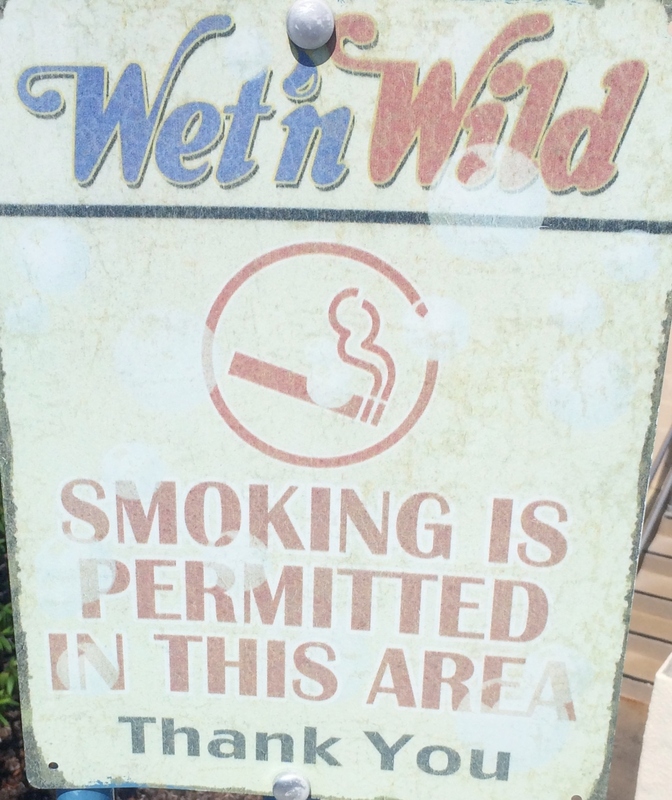 Wet n’ Wild is a smoke free park so please consult with the park map to see where the designated smoking sections are. 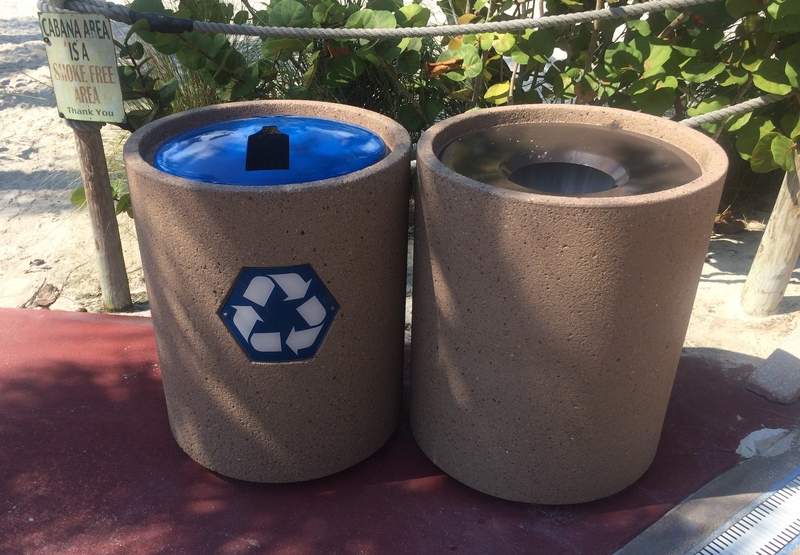 There are several trash and recycling bins through the park so please recycle if you can and deposit the trash in the bins provided and NOT on the ground. 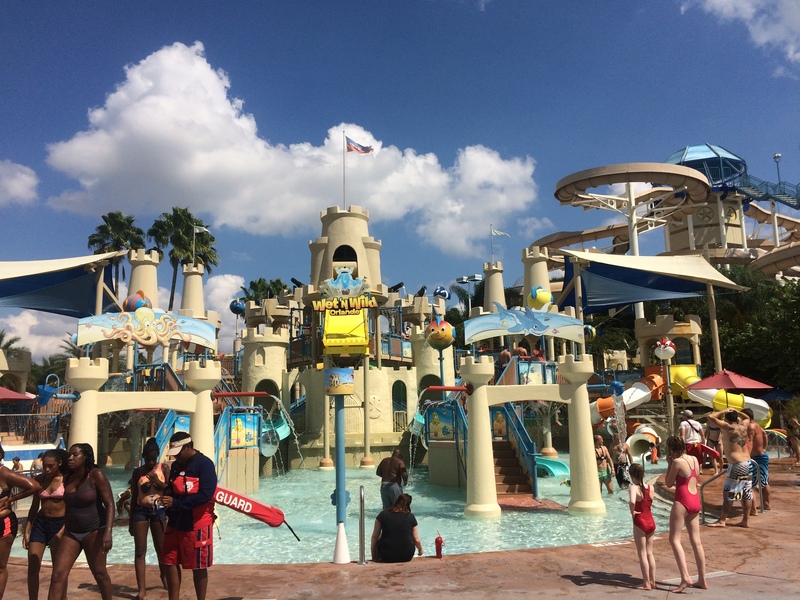 Now that you’re ready and familiar with the park policies, let’s dive in. 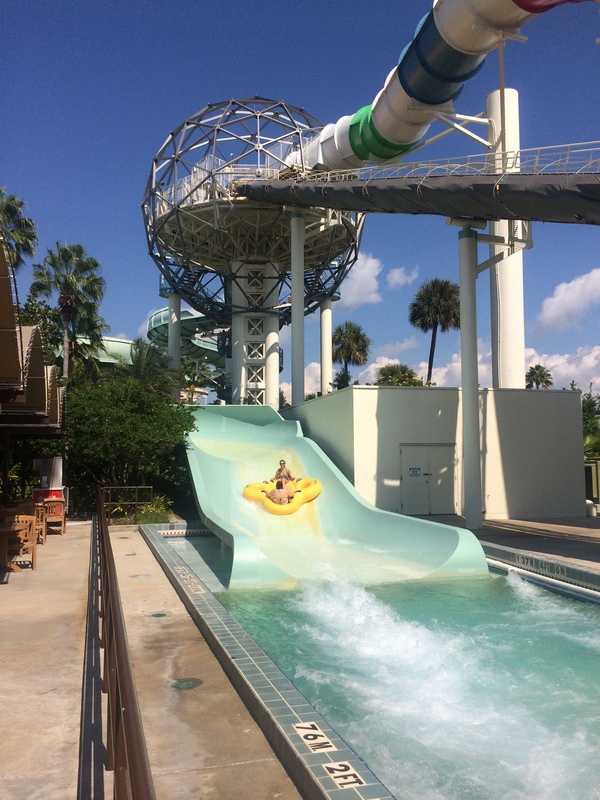 I highly recommend you come with someone who will go on the slides with you as five of the eleven slides are family slides which require a minimum of two people and there are no single rider lines. We’ll head back across the gate to our first area which is a giant play structure for the kiddies. This area has always been a kids area since the day the park opened and was called Kids Park. 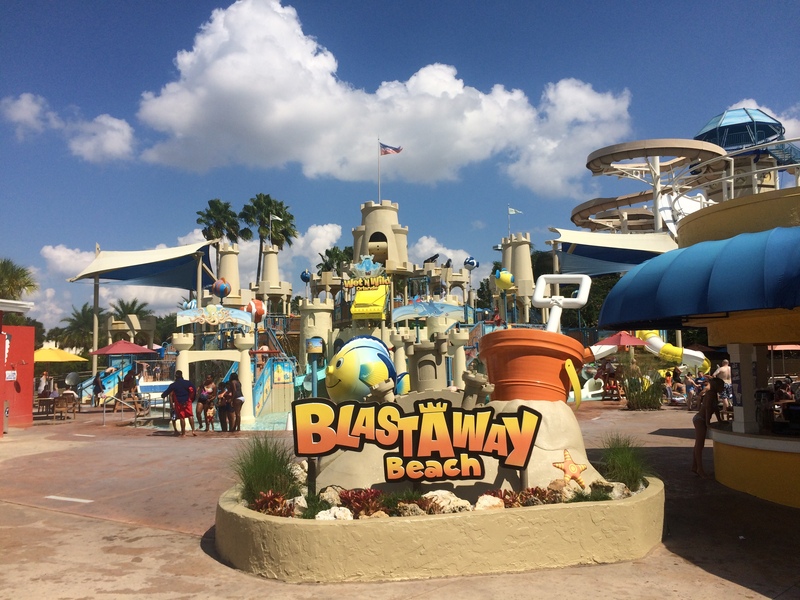 The area retained the name until 20011 when it was closed and remodeled with a sandcastle theme. 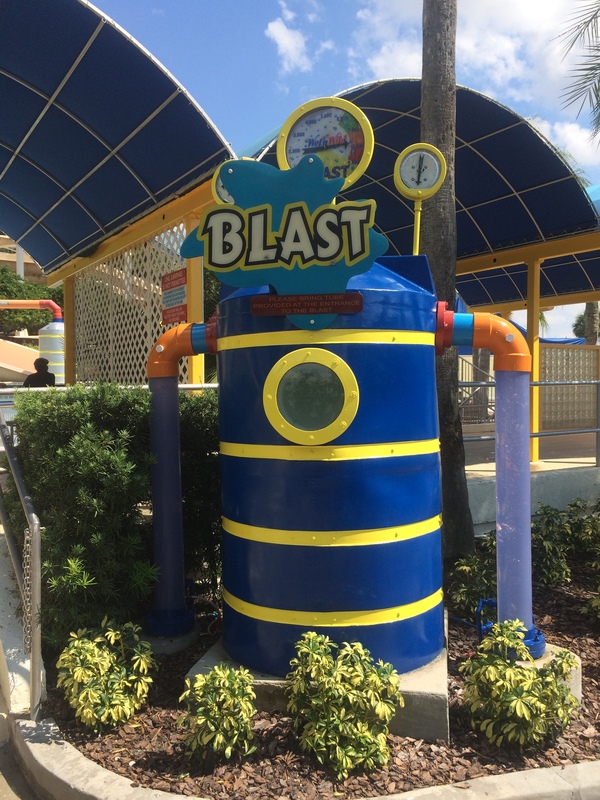 Three Kidz slides from ProSlide Technology were added as well as a castle play structure from Integrity Attractions which includes a 250 Gallon (US) bucket that tips over every three and a half minutes. Next up is a complex of slides that I believe were all built by WhiteWater Slides and opened in 1986. The three slides were called Mach 5 Alpha that is up top and has three slides that use mats, Mach 5 Beta that used single person rafts, and the Raging Rapids which used single person rafts and comprised of a series of swirling pools, slides, and waterfalls to make you feel like you’re rafting down a raging river rapid. 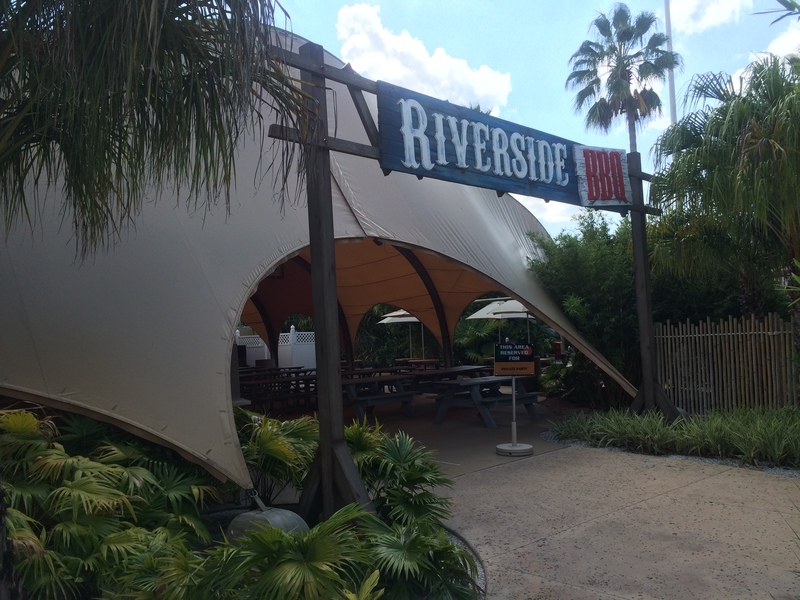 The first of these rides we come to is the Blast which used to be the Raging Rapids. This was renovated in 2003 to make you think you’re going through a factory that is having their blown water lines repaired. 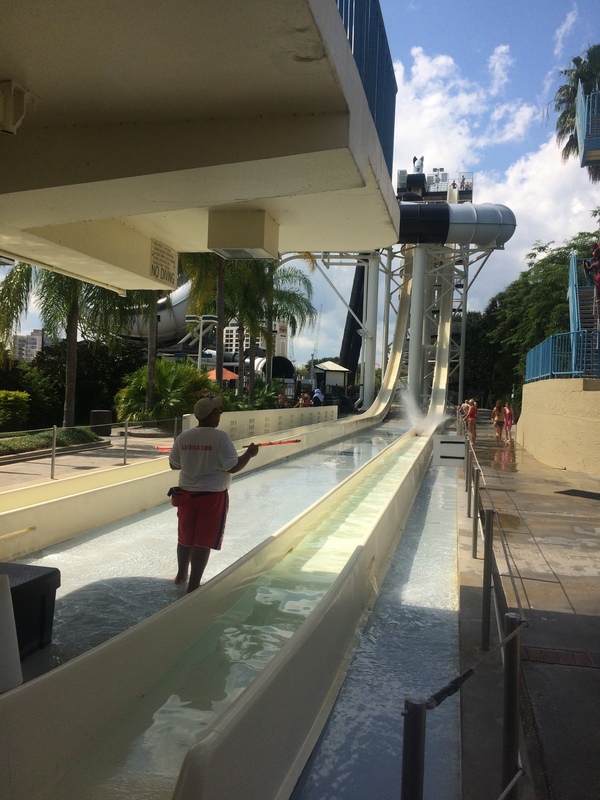 You’ll encounter several waterfalls and water spray elements from those broken water lines on this slide. Here is an on ride view from Attraction’s Magazine’s YouTube Channel. 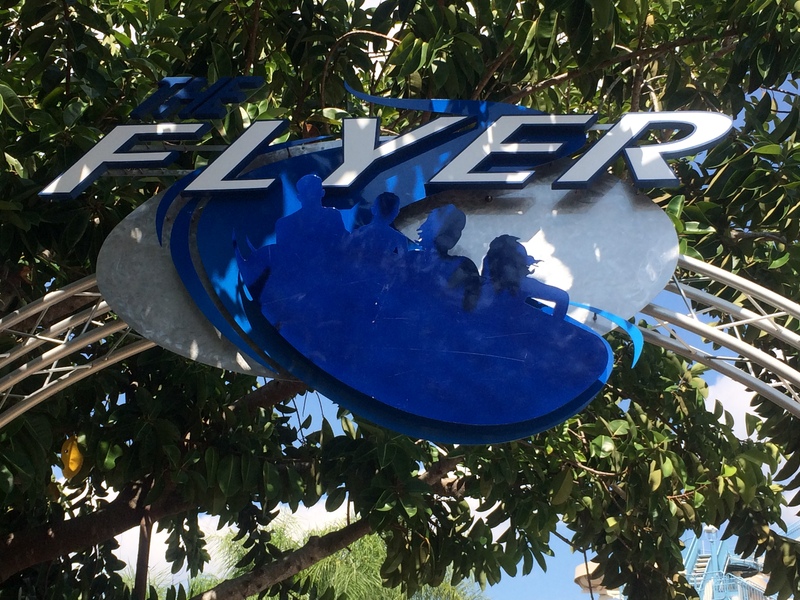 The next slide in this complex is called The Flyer. 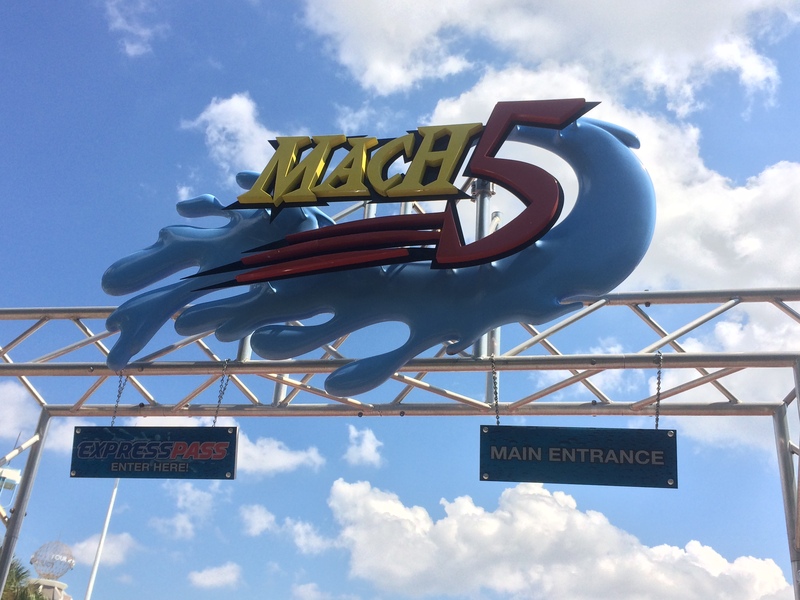 It originally was called Mach 5 Beta and had two slides that used single person rafts. 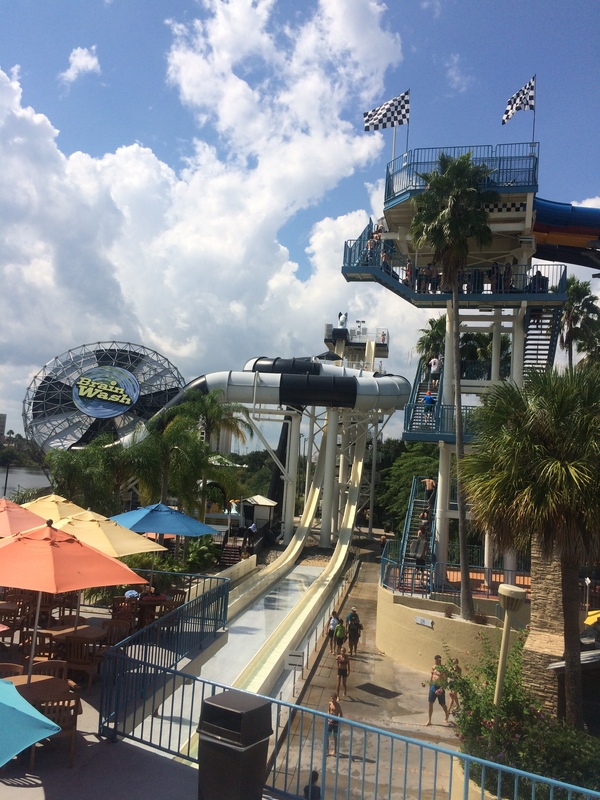 Then, in 1996, it was retrofitted by ProSlide so that a four person, toboggan style raft could fly down the course on both sides and was renamed the Fuji Flyer. A few years after that, the Fuji part of the name was dropped as I believe the Fuji Film sponsor was dropped and the slide was renamed, The Flyer. This is also one of those slides where single riders are not allowed. Here’s an on ride video from Deathbyillusion’s YouTube channel. The last one in this complex is Mach 5 Alpha. This attraction has basically been unchanged since it originally opened in 1986 aside from the “Alpha” part of the name being dropped. This one has three slides that use mats that you lay down on as you’re going through the course. Each slide is different so don’t automatically assume they’re exactly the same. 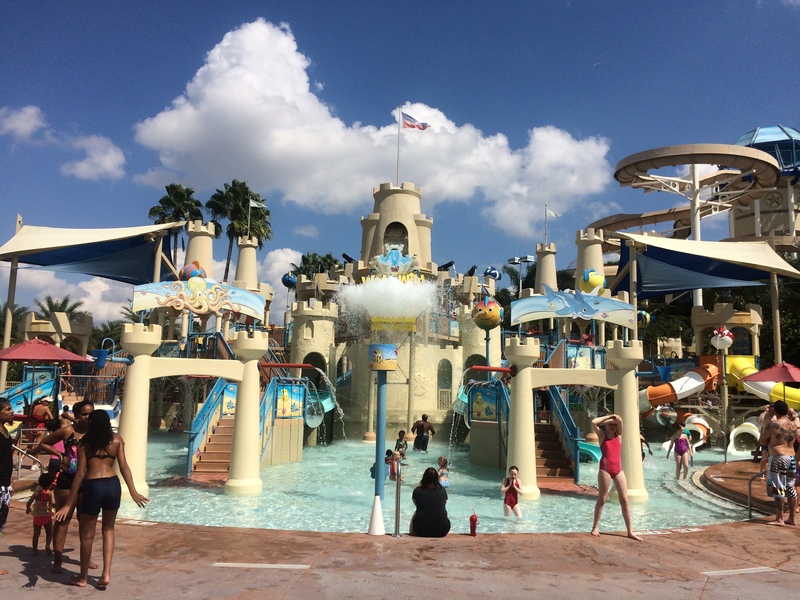 Unfortunately, the slide was down for maintenance when I was last there but I have been on it many times so I can tell you it is quite a fun experience, especially the final three drops into the splashdown pool. Here’s a hint, pull the nose of the mat up slightly just before you hit the pool and you might go a little farther before you stop. Here’s an on ride video of slide “C” from Deathbyillusion’s YouTube Channel. Slide C is the one that faces the parking lot when you start out and is, in my opinion, the best of the three slides on the top. 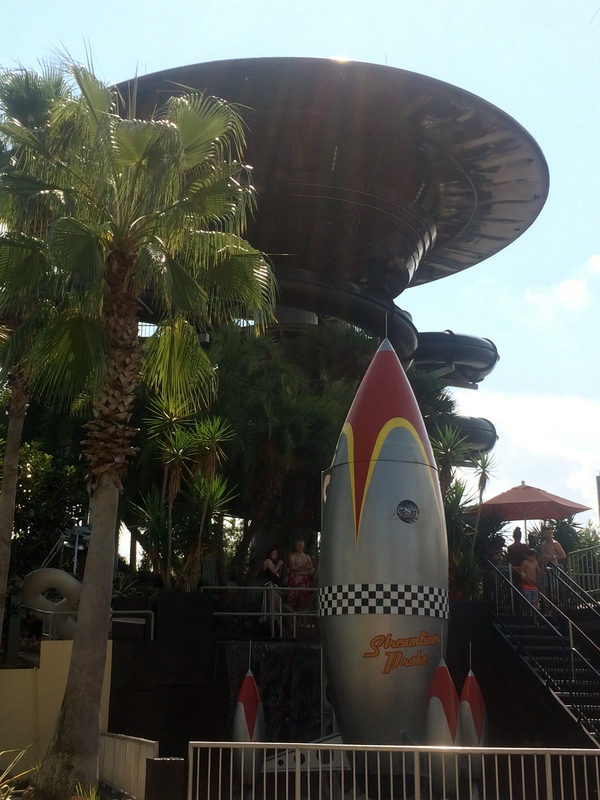 The next one is a combination tower as well but this area was previously home to two attractions. The first one was the Banzai Boggan which was a toboggan style slide where riders carried plastic toboggans to the top of the 32 foot tall tower where they would then sit on top of then and slide down a steeply banked slide and then skip over the water at the bottom until they came to a stop. 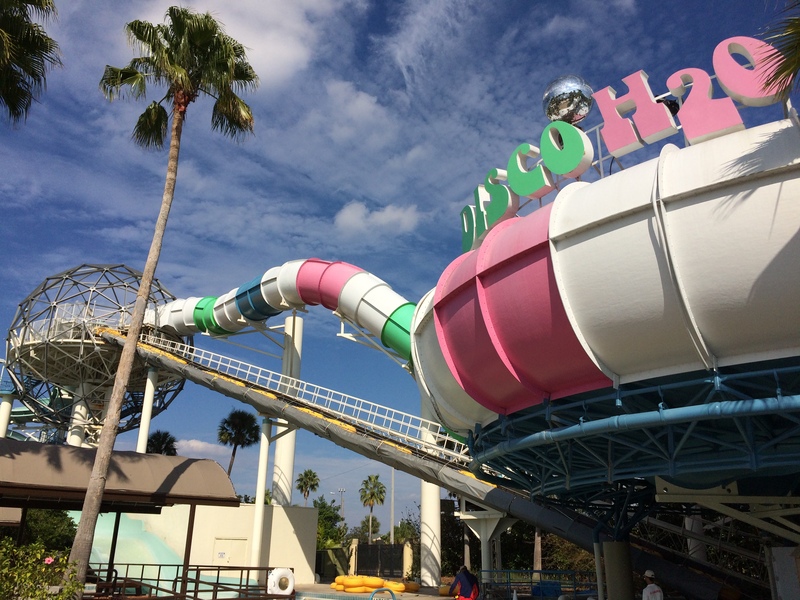 That ride was then replaced by Hydra Maniac in 1986 which had two enclosed translucent body slides at the top of the old Banzai Boggan tower that were blue, and the other two enclosed. 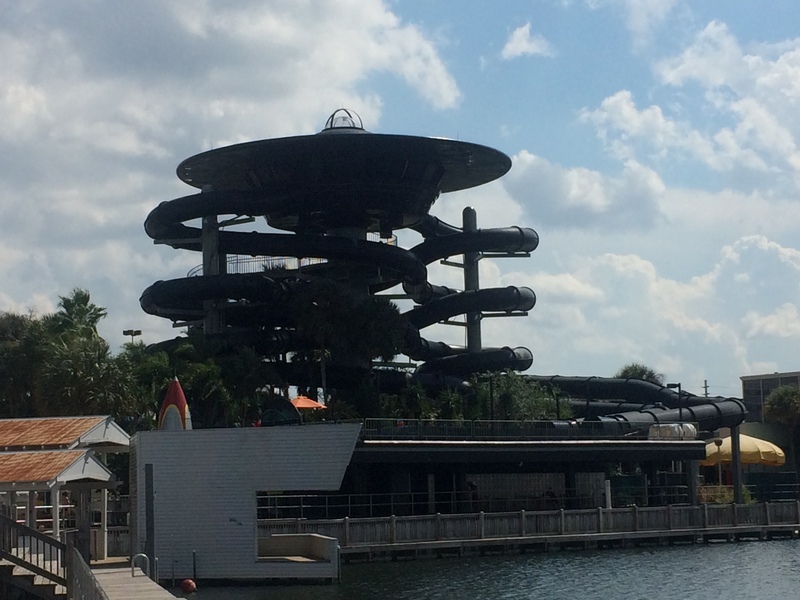 Both slides took riders through a steeply banked a 360 degree turn to the pool below. That was then replaced by the Surge in 1994. 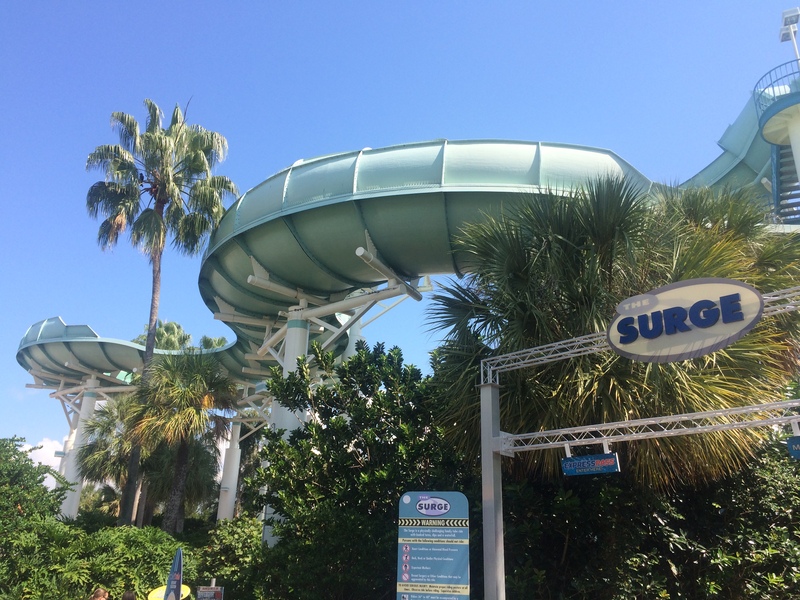 The surge is a Mammoth slide from ProSlide and requires a minimum of two riders with a maximum of for riders per raft. Here is an on ride vide from Deathbyillusion’s YouTube channel. 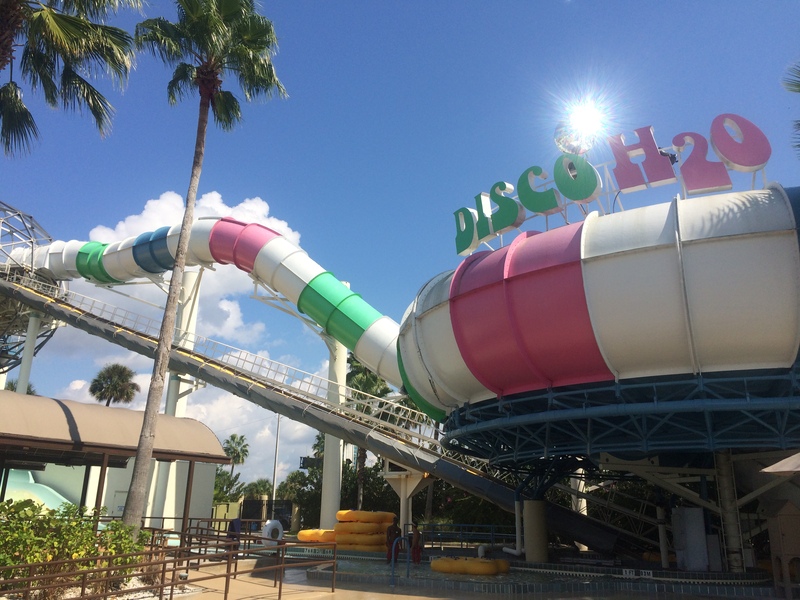 The other slide on this tower is Disco H2O which opened here in 2005. 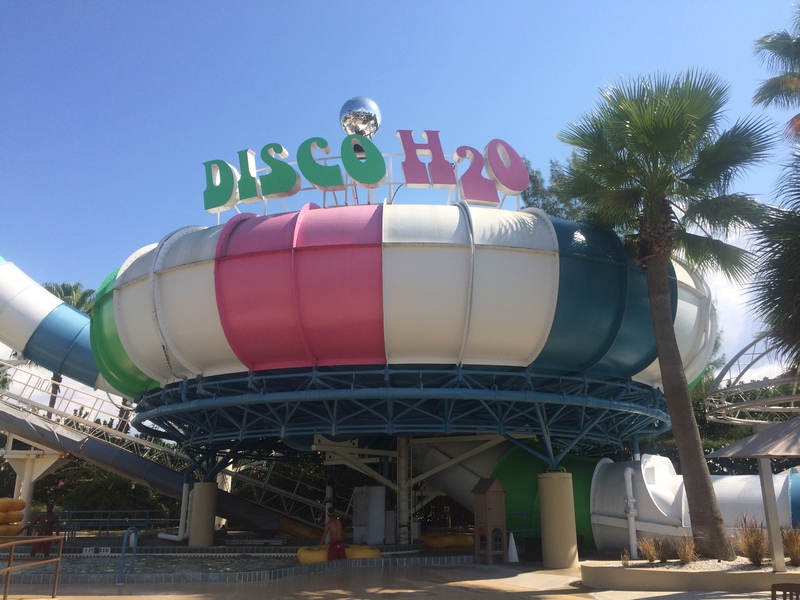 Disco H2O is a rather unique ride as it is an Enclosed Behemoth Bowl from ProSlide that is themed to the 1970’s Disco era with Disco music playing inside the large bowl and a Disco style center piece hanging from the center. 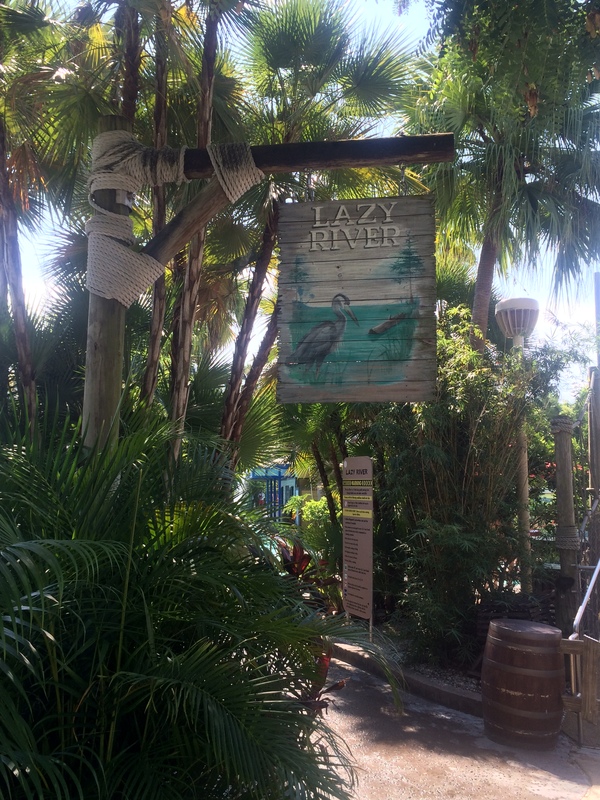 This is also not a single rider friendly attraction as a minimum of two riders with a maximum of four riders are required per raft. This is also one of the two slides I haven’t been on so far. Here’s an on ride video from ThemeparkHD’s YouTube channel. 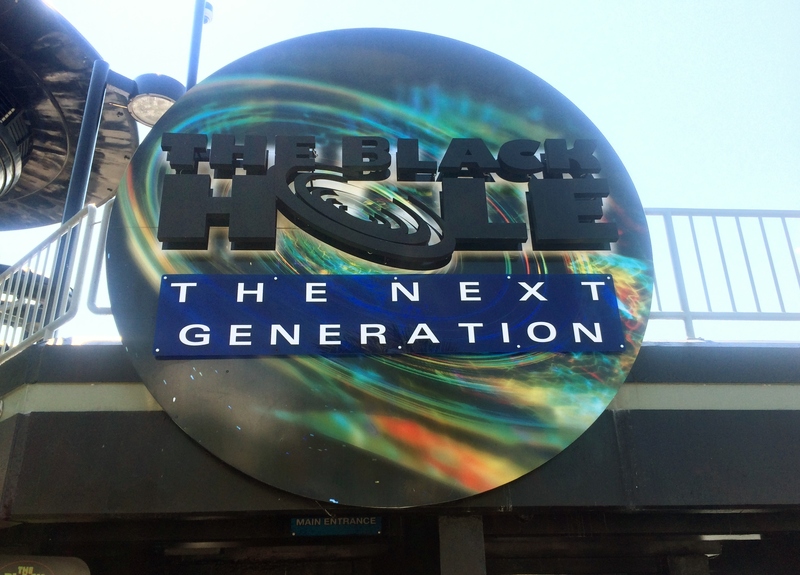 Next up is another single rider unfriendly attraction called the Black Hole. 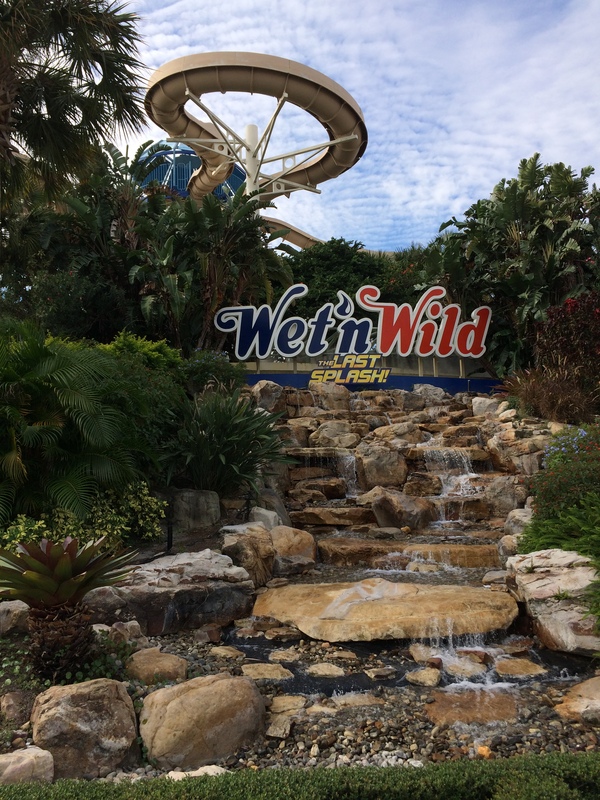 This attraction actually replaced another tube slide called the Corkscrew that was also from WhiteWater. This attraction used the same tower but was not as tall and used open slides laid out in a corkscrew design instead of the fully enclosed slides you see here today. 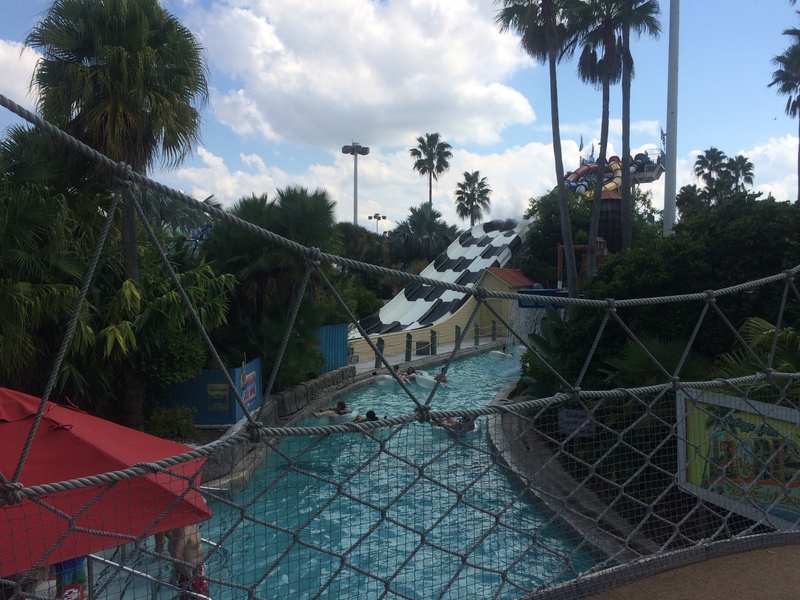 The ride ended by going through a tunnel and then emptying out onto the receiving pool. Then, in 1989, the Corkscrew was closed forever. The tower was raised and fully enclosed black slides were installed that were thick enough that light couldn’t penetrate it. That was necessary as there were several light up designs throughout the ride. 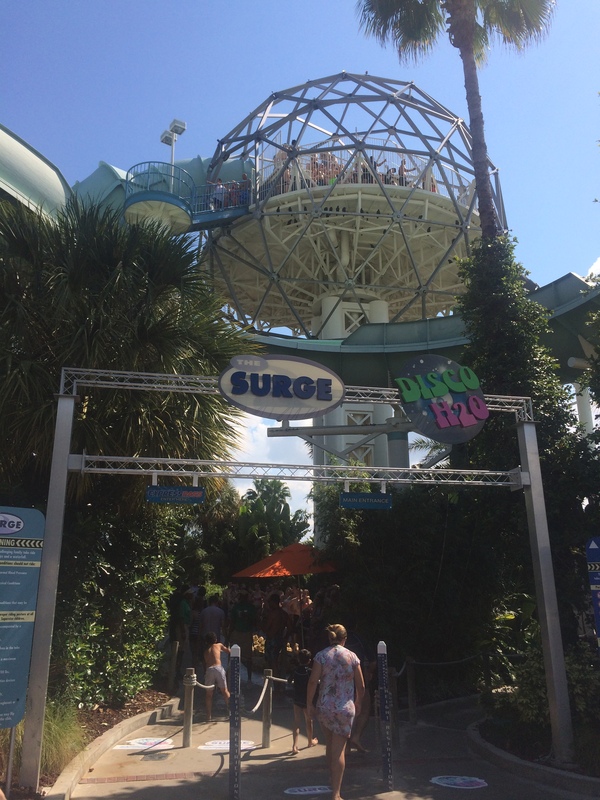 This ride also has the distinction of being on of the worlds first themed water rides. The dispatch area up top was also enclosed and given a space station theme. Here’s an on ride view from Deathbyillusion’s YouTube channel. 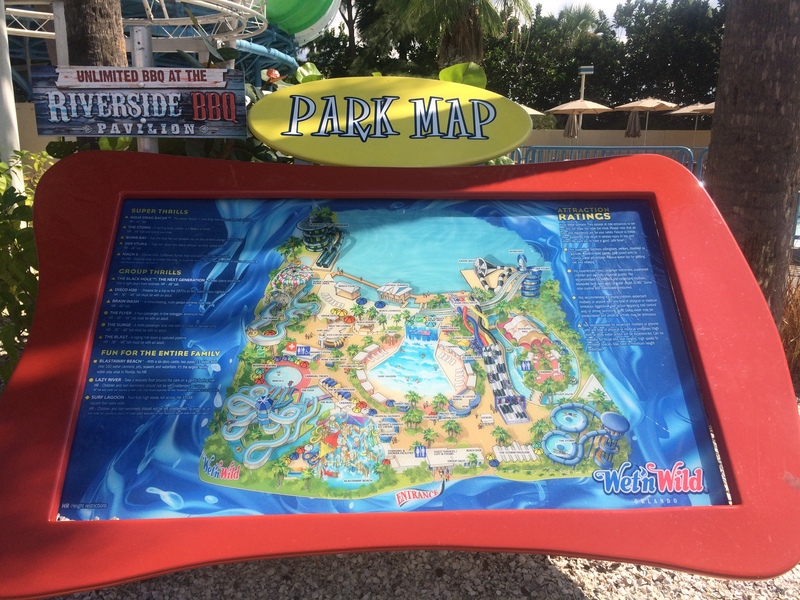 Now we’ve reached one end of the park and let’s say you’re getting hungry now and just want to find a place to get a bite to eat and relax in the sun or the shade so we’ll now head towards the Surf Lagoon Wave Pool. 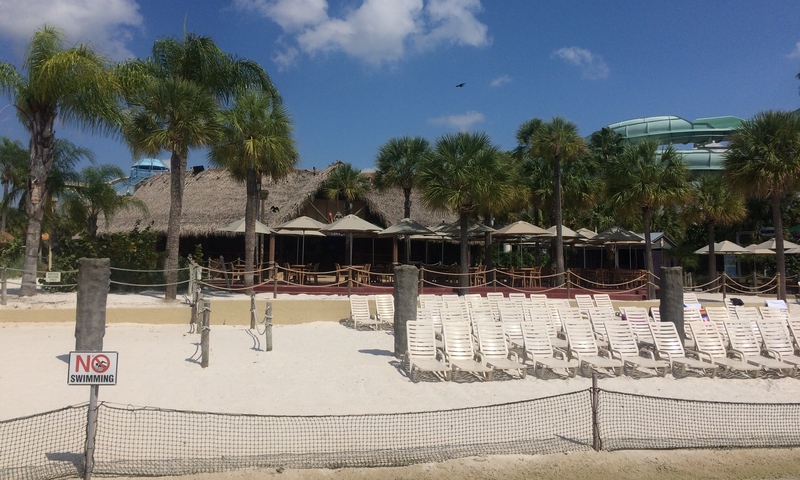 This area is quite big and has lots of places to choose from to get your meal and just soak up the sun. 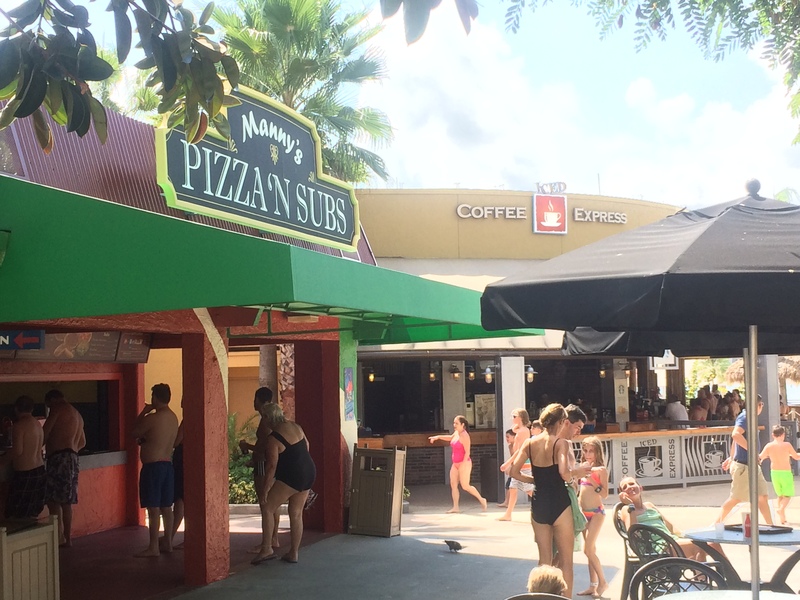 These are the restaurants you’ll see near the Surf Lagoon Wave Pool and they serve barbecue, burgers, French fries, drinks, and others. The first ones are on the east side near the Surge and Disco H2O and there’s a first aid station in that area as well. 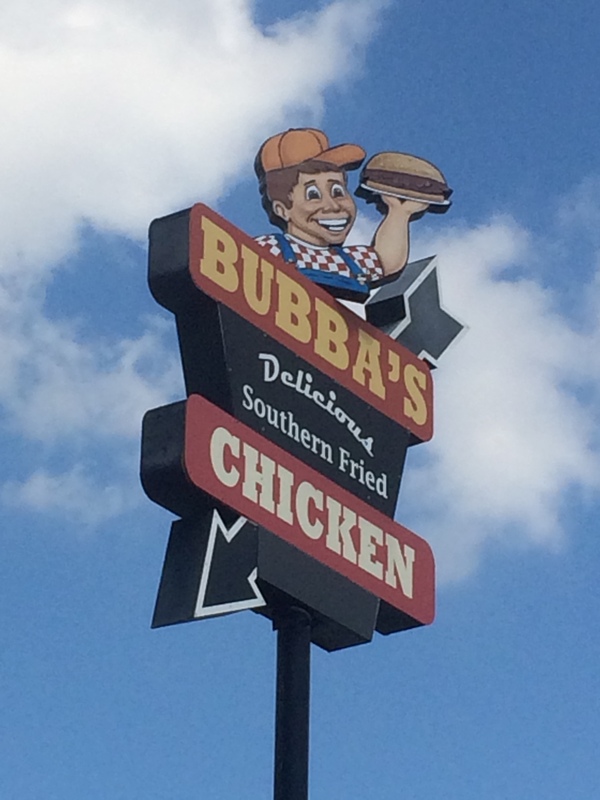 The Ice Cream stand is near BlastAway Beach and Bubba’s Delicious Southern Fried Chicken is on the west side near the Aqua Drag Racer. There are plenty of places to lounge while you take a break to digest everything before getting back into the water. There are sundecks and shaded tables and picnic groves around the Surf Lagoon Wave Pool and on the Sandy Lake beach. Speaking of the lake, there used to be an attraction on the lake called the Wake Zone where you can go Wake Skating, Knee Skeeing, or just about any other form of water recreation. 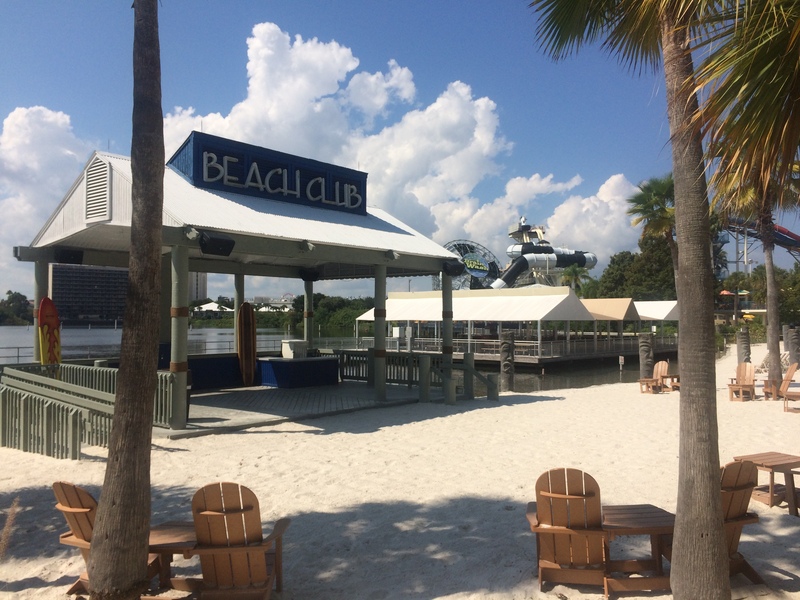 The entrance to that attraction was where the Beach club building is now. It was installed here in the late 1980’s and was removed sometime in 2014. Here are some on ride video’s from Mudsplat Productions and Thomas Barryhill’s YouTube channels. Next up is the Surf Lagoon Wave Pool. 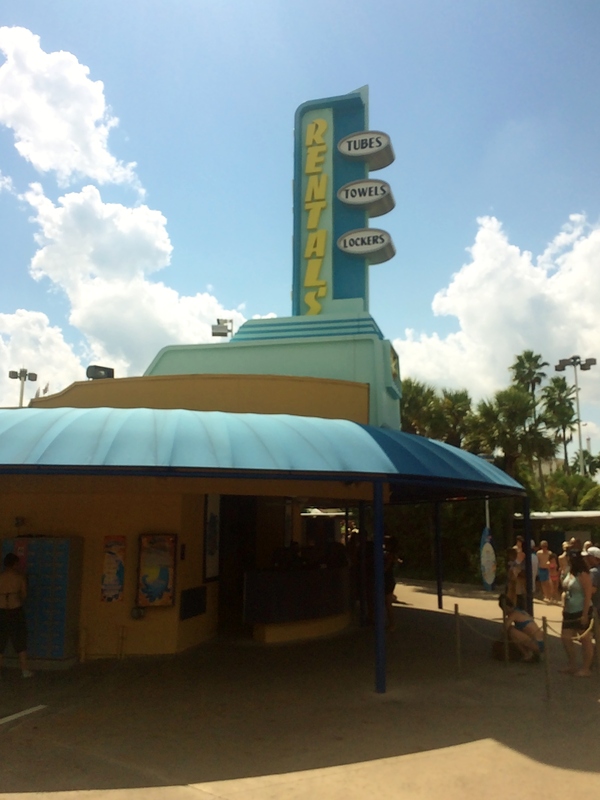 This is the only attraction left from when the park opened in 1977. This also was one of the first wave pools in North America and the only one that is older is the Wave Pool at Point Mallard Park near Decatur, Alabama, USA. There are several lifeguards on duty but there are still rules that must be followed. 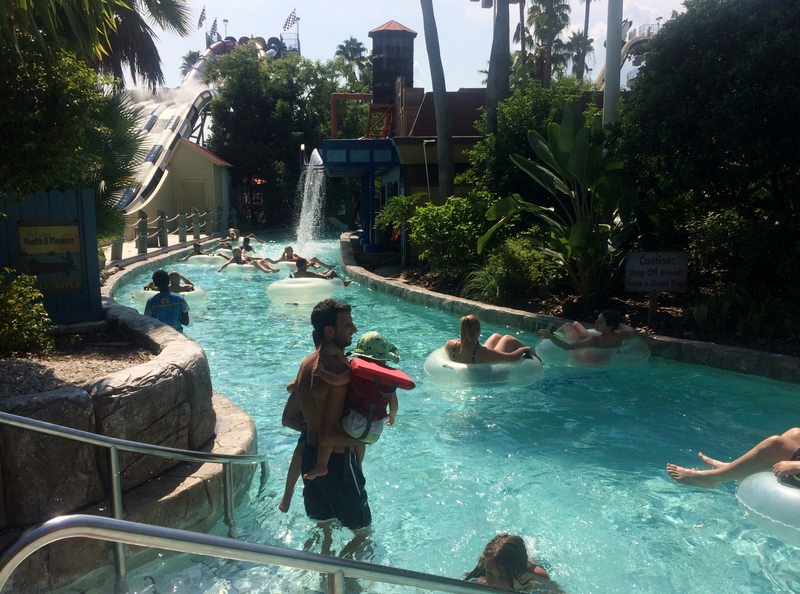 Here are several photos of the wave pool in action and when there are no waves. The waves operate in about five-minute intervals with five minutes of waves that are announced by a horn followed by a “surfer’s warning”, and then there’s a five-minute period of no waves. These were taken during the no waves period. These were taken during the waves period. The waves may look small in the photos but they’re quite big in the deep end. 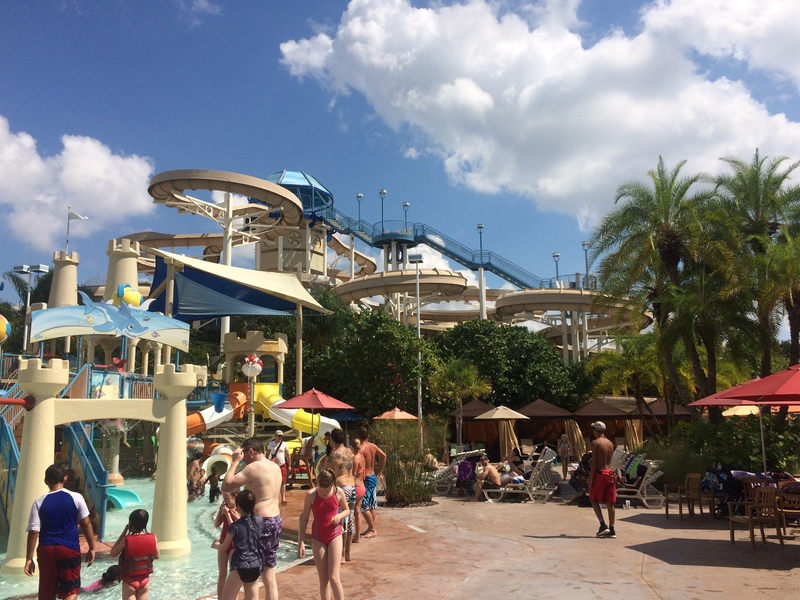 Well, it’s time to hit the slides again after a nice dip in the wave pool and some time in the sun. 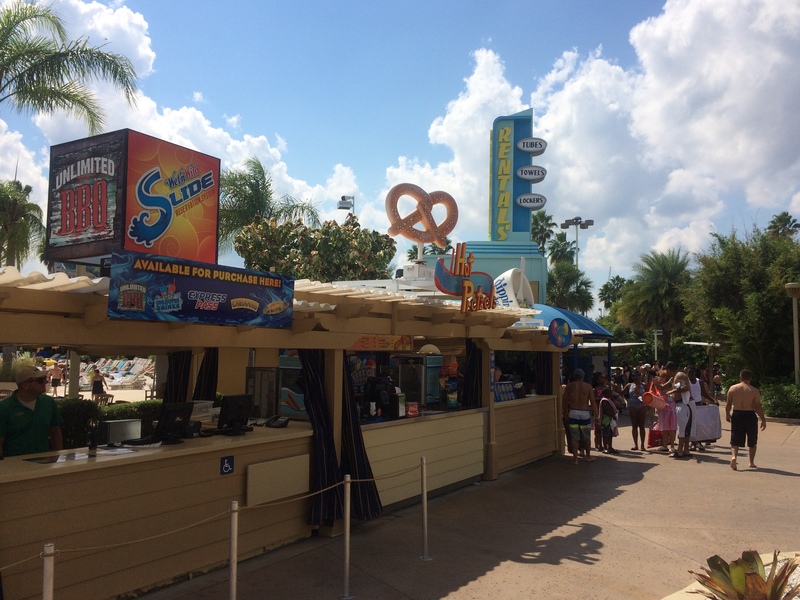 Now we’ll head past the Aqua Drag Racer, Lazy River, and the Storm picnic pavilions towards the northwestern corner of the park. Our next slide is a pair of ProBowl slides from ProSlide called The Storm. These twin bowls were installed in 2001 and are single rider friendly. This was the first time I had ever ridden something like this and it was quite fun, especially getting dropped into the pool head first. Here’s an on ride view from Deathbyillusion’s YouTube channel. Now we’ll come back to the Lazy River and just float for a while. This river was built sometime in the mid 1980’s and originally included a large pool that had several water features like a mushroom waterfall and a waterfall on the side of the pool. That was eventually filled in for a special events area but the entrance still exists and it is where the boiling water and waterfall feature is now. Here’s an on river video from Deathbyillusion’s YouTube channel. Speaking of the special events area, here it is. 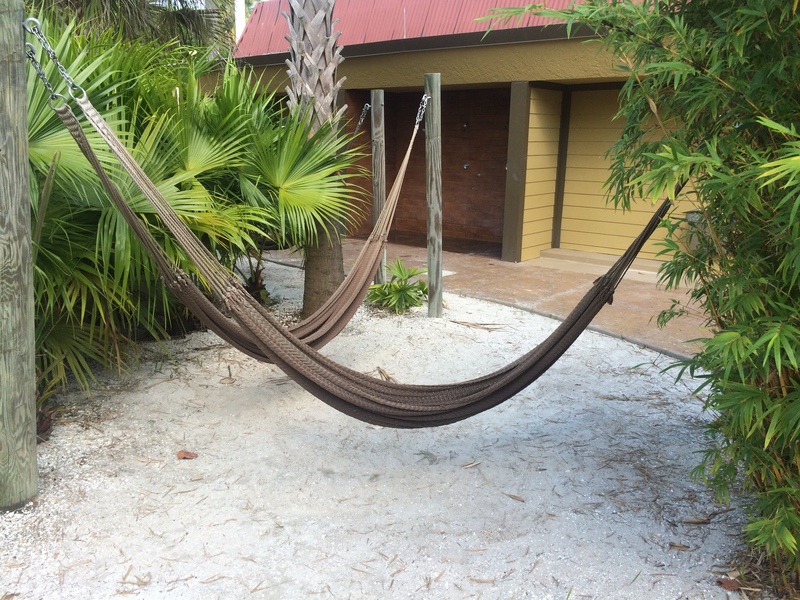 There are picnic pavilions, restrooms, outdoor showers to rinse off in, and hammocks to lounge in. 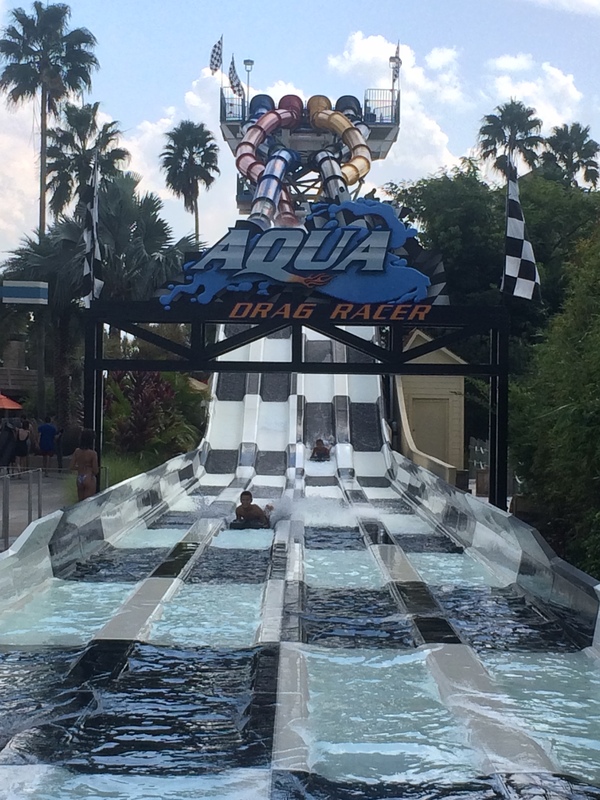 Next up is the parks newest addition called the Aqua Drag Racer. 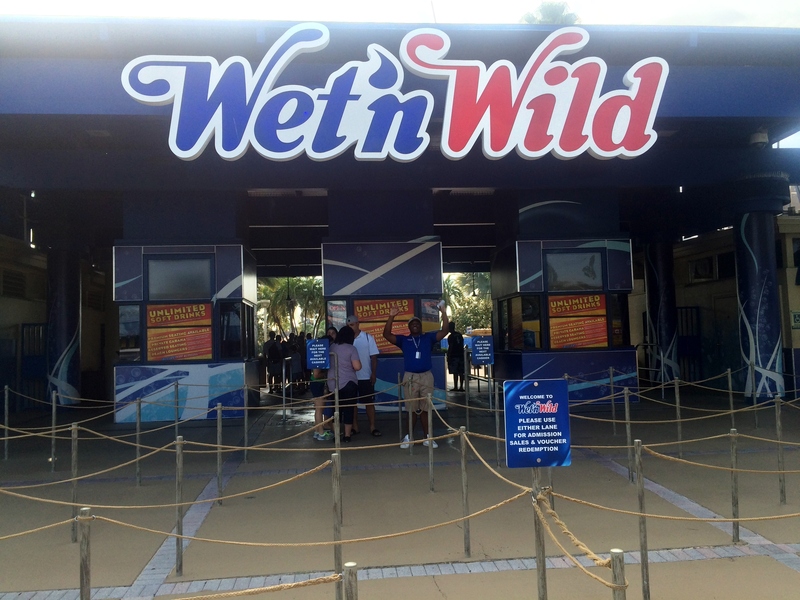 This attraction actually was the third slide on this location. 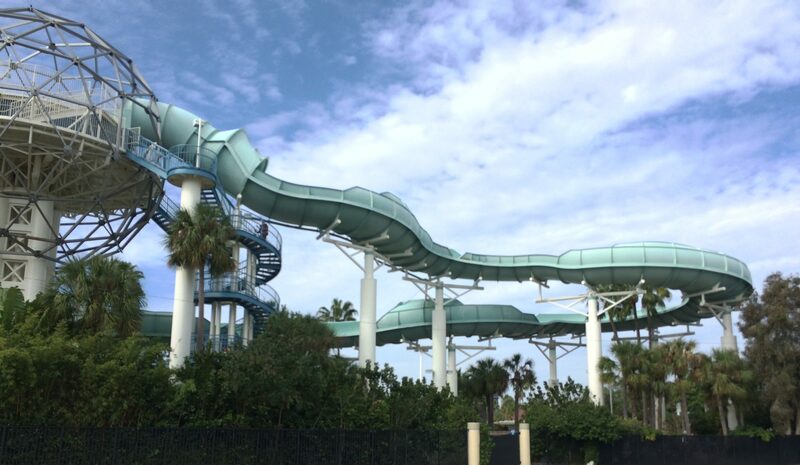 The first one was the Kamikaze which was a single rider friendly body slide where riders would slide down in one of four slides down an undulating straight course down to the bottom. That slide opened with the park in 1977 and was made of gunnite which had to be formed by hand. 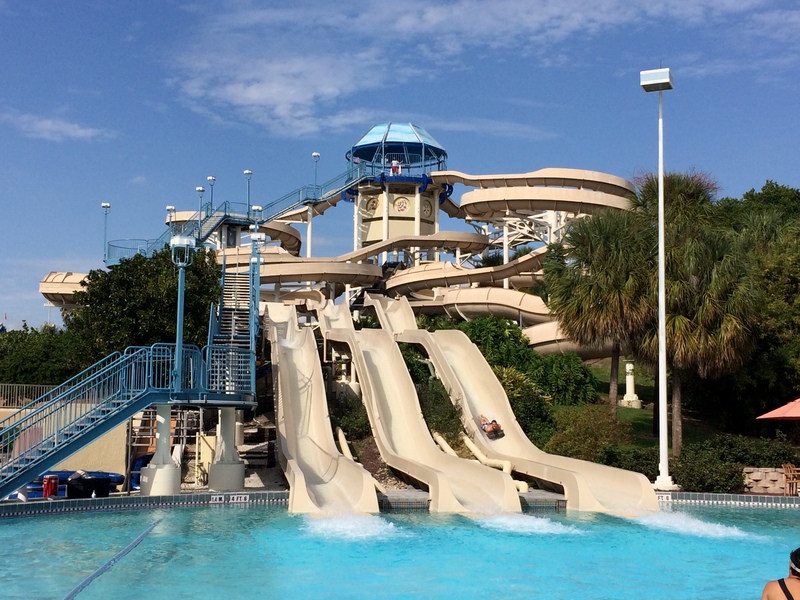 Most water slides are made of a more durable composite material these days. The Kamikaze lasted until 1991 when it was eventually replaced with the Bubba Tub. The Bubba Tub was a Family Raft Slide from ProSlide that basically followed the three drops of the Kamikaze but in one big slide that used rafts that could accommodate groups from two to five people. 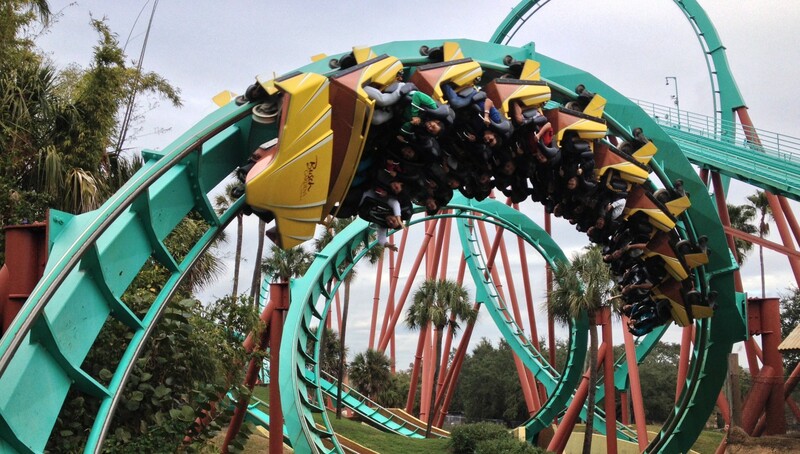 I’ve been on this one before and I can tell you that there was some major airtime on the last drop. Here’s an on ride video of the Bubba Tub from Deathbyillusion’s YouTube channel. 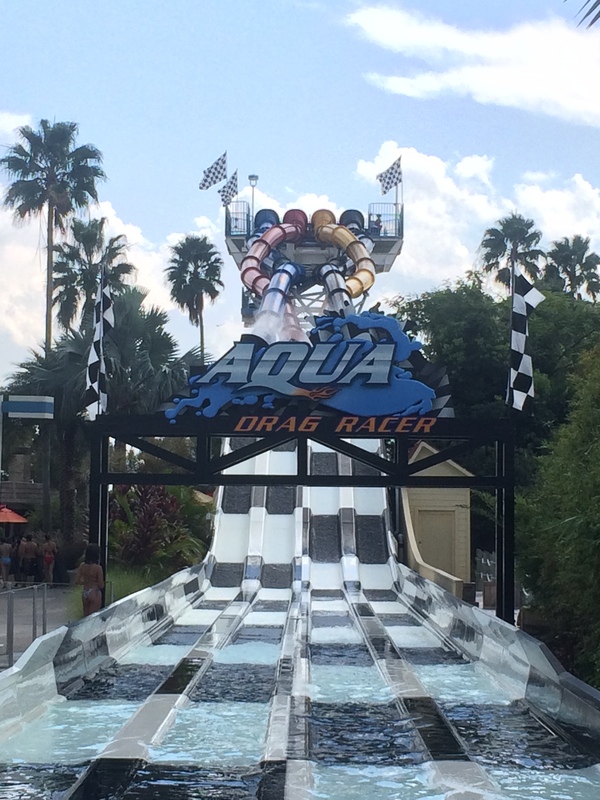 The Bubba Tub was replaced by the Aqua Drag Racer in 2014 which is a mat racer from ProSlide. You’ll pick up you’re mat at the bottom, walk up to the top, choose one of four slides, and wait for the life guard to release you. Once you’ve been given the all clear, you’ll push-off and race to the bottom. They actually time you at the end of your lane so you can see who was the quickest. 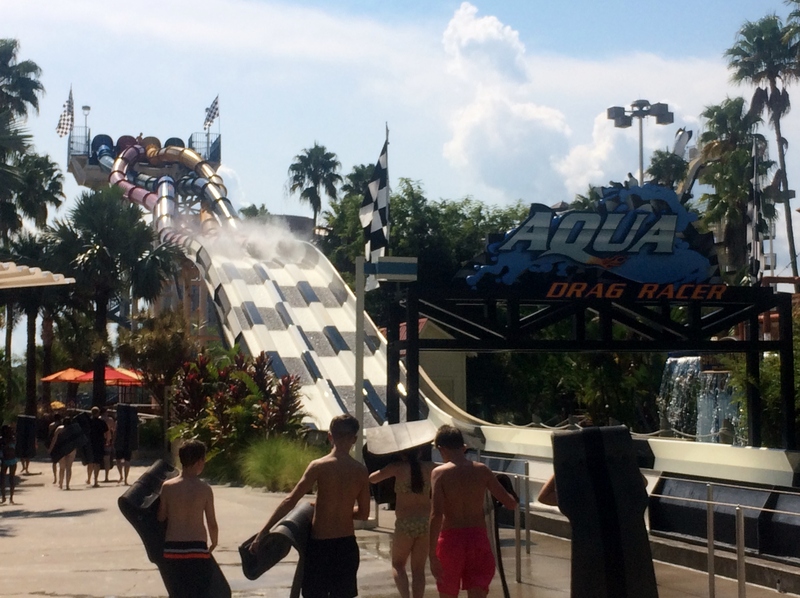 Here’s an on ride video of Aqua Drag Racer from Visit Orlando’s YouTube channel. Next up is our very last slid complex and like most of the other slides here, this one has a history as well. 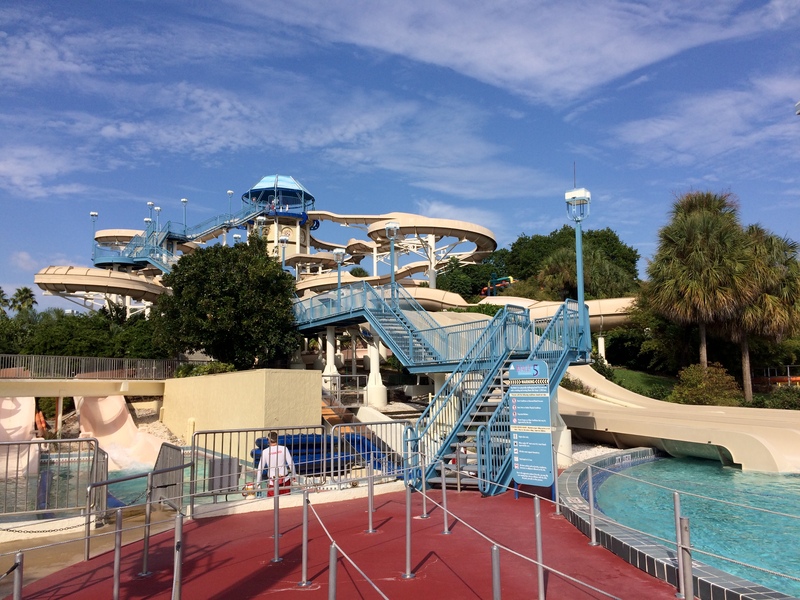 This slide complex currently houses three water slides but it originally only was one ride called Der Stuka. Der Stuka is German for Dive Bomber and is the tallest ride at Wet n’ Wild and has operated here ever since it opened in the 1980’s.The tower itself is six stories tall and the slide itself drops riders at a nearly vertical angle down a 250 foot slide with an approximately 115 foot water trough at the bottom to slow riders to a stop. 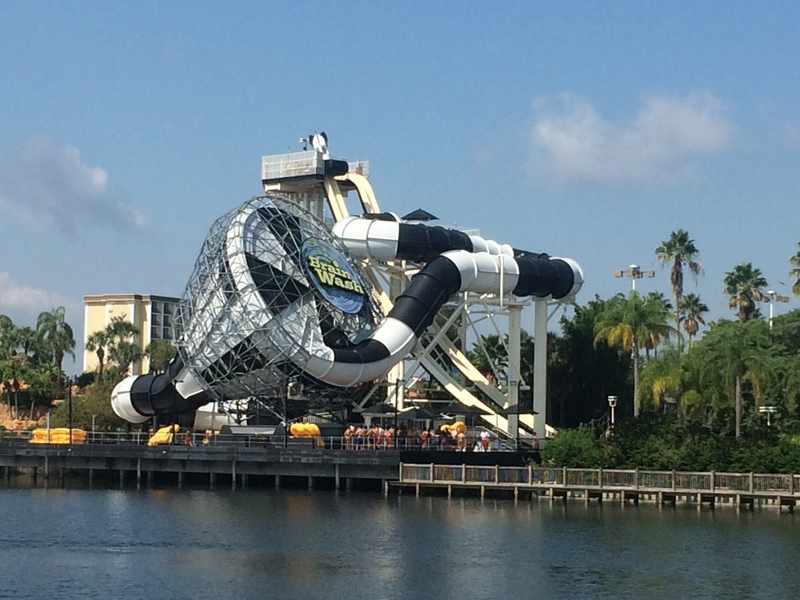 This is a Freefall Body slide possibly from White Water Slides and is obviously very single rider friendly. There were originally three of these Der Stuka slides on this tower as they anticipated that the ride would be very popular, and it was for quite a few years. 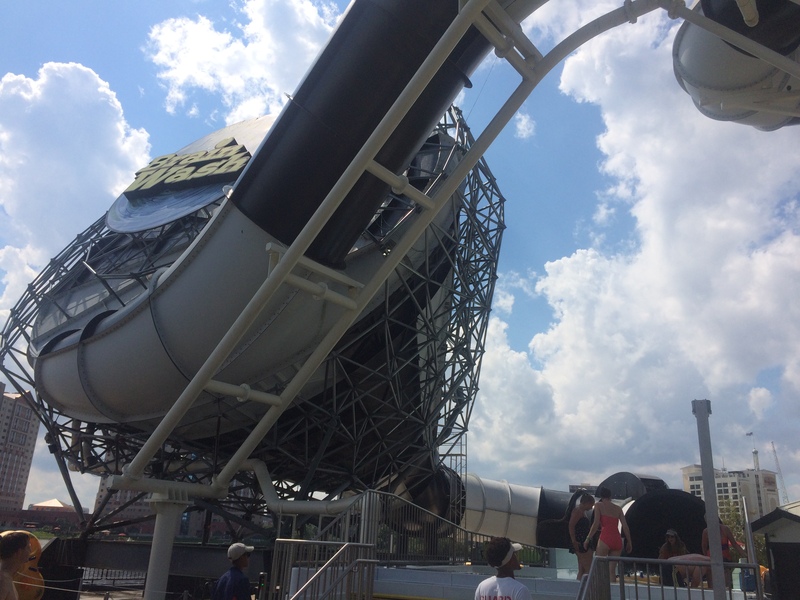 It wasn’t uncommon to see the queue going all the way down the spiral tower with all three slides open. Eventually, the ride lost its popularity so they first took out the middle slide and added an enclosed twin intertwining body slides from White Water Slides called Blue Niagara which were both 250 feet long. The park actually had to build a separate deck 3/4 up the Der Stuka tower where the Brain Wash platform is now plus a platform above the run-out area for Der Stuka as the slides them selves couldn’t reach the ground. 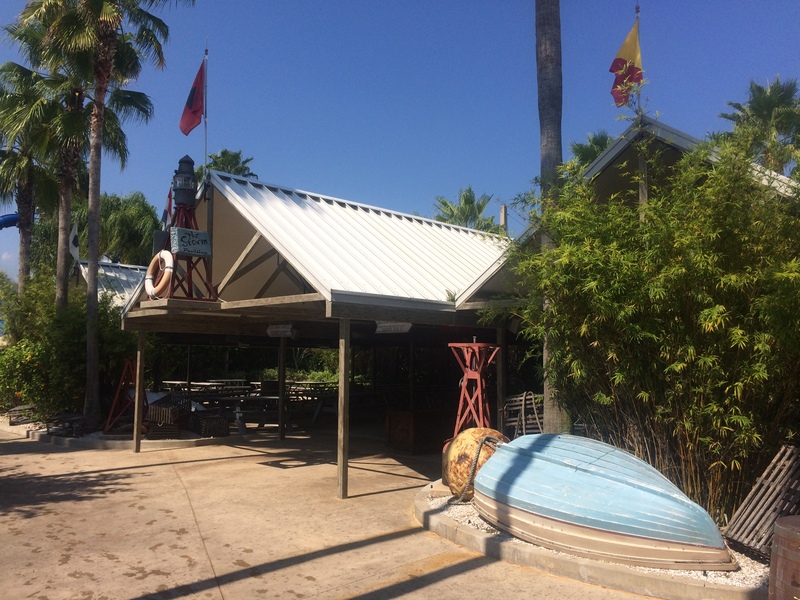 Part of that raised platform is visible in the photos above and now has covered picnic tables. Blue Niagara was an interesting slide and one of my personal favorites. 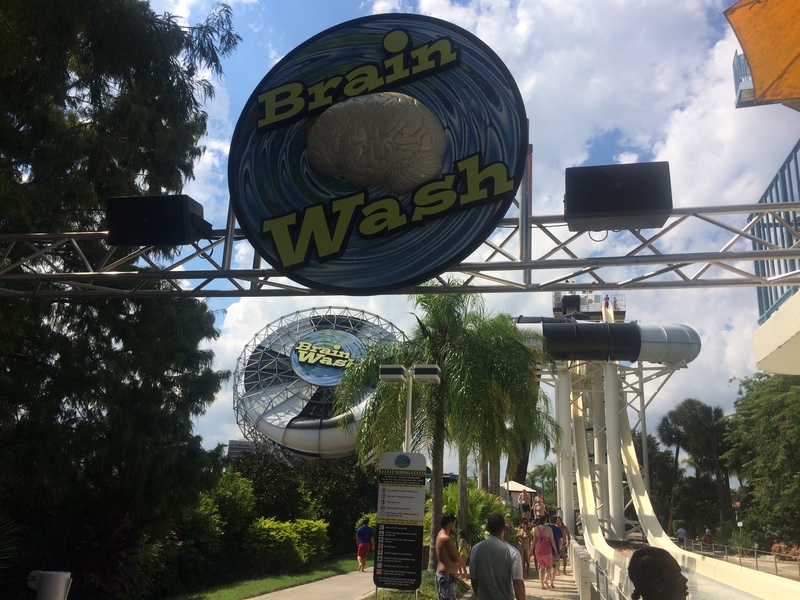 Unfortunately, that ride was removed at the end of 2007 in favor of Brain Wash. 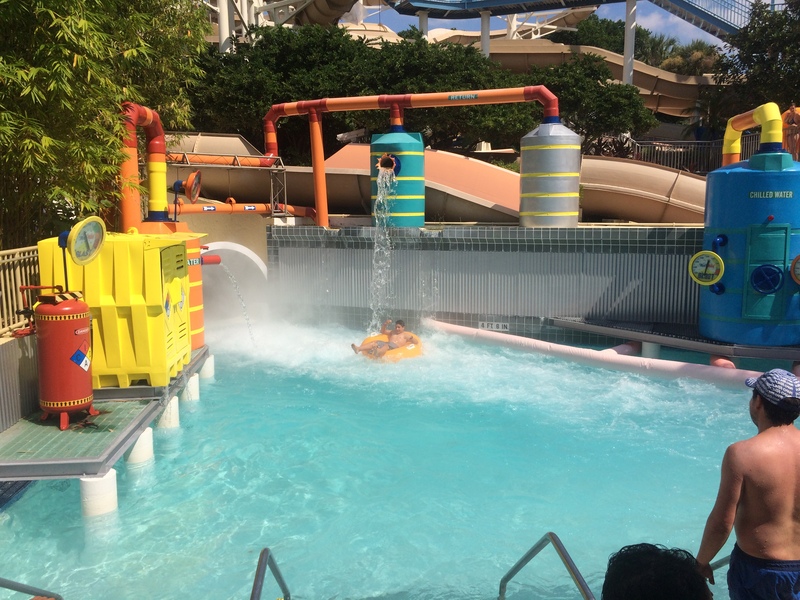 Brain Wash is an Enclosed Tornado family ride that is not single rider friendly as it requires a minimum of two and a maximum of four riders per raft. Brain Wash not only replaced Blue Niagara, it also replaced a very unique attraction called the Hydra Fighter in which riders sat back to back in two person gondolas that were suspended from a gantry above them. Each person had a water nozzle in front of them which they could turn off and on working with the person behind them so they can get their gondola swinging back and forth. Like Blue Niagara, Hydra Fighter closed at the end of the 2007 season and the big bowl section of Brain Wash now sits where Hydra Fighter used to be. Brain Wash looks to like it is an impressive slide, unfortunately I was there by myself so I couldn’t ride it but here is an on ride video from Deathbyillusion’s YouTube channel. The last slide on this tower was one of, if not the first slides of its kind. It is a single rider friendly Freefall Body slide called Bomb Bay and it was placed at the top of one of the Der Stuka slides. 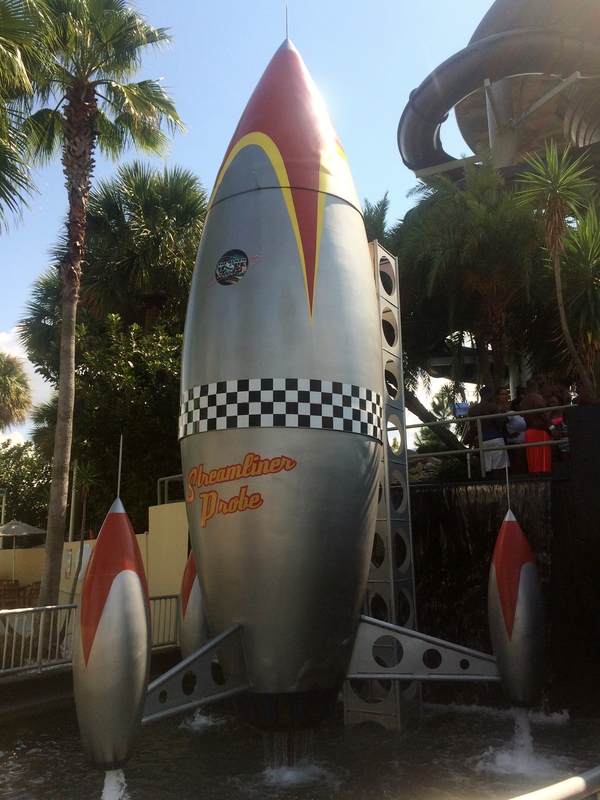 Riders board a capsule that resembles a bomb at the top, then a countdown starts. The floor then drops out from beneath you once the countdown is done and you rocket down the nearly vertical slide to the run-out below which really is quite intense. Originally, riders would board the capsule standing up, then the capsule would move into position and drop riders at the end of the count down. Unfortunately, this really slowed down the slides capacity so the movement was stopped permanently a few years after it opened. Here’s an on ride view from Deathbyillusion’s YouTube channel. Well, that’s it for this review, I hope you found this to be helpful and I hope you visit before the park closes for good on December 31, 2016. This park has been a favorite of mine ever since I was a child and I will be sad to see it go as I have many fond memories of the park.